where R1, R2, R3, R4, R5, R6, R7 and R8 are as defined in the specification. This application claims priority to provisional application Ser. No. 60/547,967, filed on Feb. 26, 2004 incorporated herein by reference in its entirety. 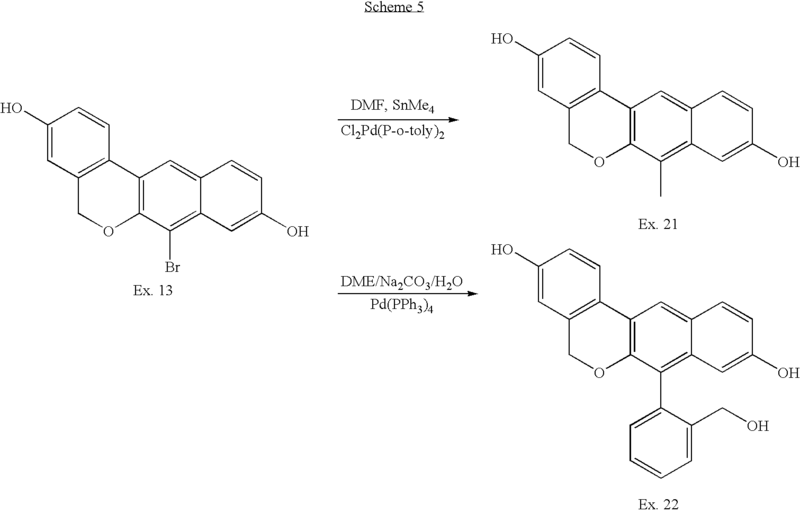 This invention relates to novel substituted 5H-dibenzo[c,g]chromene derivatives, their uses as estrogenic agents, and methods of their preparation. The pleiotropic effects of estrogens in mammalian tissues have been well documented, and it is now appreciated that estrogens affect many organ systems [Mendelsohn and Karas, New England Journal of Medicine 340: 1801–1811 (1999), Epperson, et al., Psychosomatic Medicine 61: 676–697 (1999), Crandall, Journal of Womens Health & Gender Based Medicine 8: 1155–1166 (1999), Monk and Brodaty, Dementia & Geriatric Cognitive Disorders 11: 1–10 (2000), Hum and Macrae, Journal of Cerebral Blood Flow & Metabolism 20: 631–652 (2000), Calvin, Maturitas 34: 195–210 (2000), Finking, et al., Zeitschrift fur Kardiologie 89: 442–453 (2000), Brincat, Maturitas 35: 107–117 (2000), Al-Azzawi, Postgraduate Medical Journal 77: 292–304 (2001)]. Estrogens can exert effects on tissues in several ways. Probably, the most well characterized mechanism of action is their interaction with estrogen receptors leading to alterations in gene transcription. Estrogen receptors are ligand-activated transcription factors and belong to the nuclear hormone receptor superfamily. Other members of this family include the progesterone, androgen, glucocorticoid and mineralocorticoid receptors. Upon binding ligand, these receptors dimerize and can activate gene transcription either by directly binding to specific sequences on DNA (known as response elements) or by interacting with other transcription factors (such as API), which in turn bind directly to specific DNA sequences [Moggs and Orphanides, EMBO Reports 2: 775–781 (2001), Hall, et al., Journal of Biological Chemistry 276: 36869–36872 (2001), McDonnell, Principles Of Molecular Regulation. p 351–361(2000)]. A class of “coregulatory” proteins can also interact with the ligand-bound receptor and further modulate its transcriptional activity [McKenna, et al., Endocrine Reviews 20: 321–344 (1999)]. It has also been shown that estrogen receptors can suppress NFκB-mediated transcription in both a ligand-dependent and independent manner [Quaedackers, et al., Endocrinology 142: 1156–1166 (2001), Bhat, et al., Journal of Steroid Biochemistry & Molecular Biology 67: 233–240 (1998), Pelzer, et al., Biochemical & Biophysical Research Communications 286: 1153–7 (2001)]. Estrogen receptors can also be activated by phosphorylation. This phosphorylation is mediated by growth factors such as EGF and causes changes in gene transcription in the absence of ligand [Moggs and Orphanides, EMBO Reports 2: 775–781 (2001), Hall, et al., Journal of Biological Chemistry 276: 36869–36872 (2001)]. A less well-characterized means by which estrogens can affect cells is through a so-called membrane receptor. The existence of such a receptor is controversial, but it has been well documented that estrogens can elicit very rapid non-genomic responses from cells. The molecular entity responsible for transducing these effects has not been definitively isolated, but there is evidence to suggest it is at least related to the nuclear forms of the estrogen receptors [Levin, Journal of Applied Physiology 91: 1860–1867 (2001), Levin, Trends in Endocrinology & Metabolism 10: 374–377 (1999)]. Two estrogen receptors have been discovered to date. The first estrogen receptor was cloned about 15 years ago and is now referred to as ERα [Green, et al., Nature 320: 134–9 (1986)]. The second was found comparatively recently and is called ERβ [Kuiper, et al., Proceedings of the National Academy of Sciences of the United States of America 93: 5925–5930 (1996)]. Early work on ERβ focused on defining its affinity for a variety of ligands and, indeed, some differences with ERα were seen. The tissue distribution of ERβ has been well mapped in the rodent and it is not coincident with ERα. Tissues such as the mouse and rat uterus express predominantly ERα, whereas the mouse and rat lung express predominantly ERβ [Couse, et al., Endocrinology 138: 4613–4621 (1997), Kuiper, et al., Endocrinology 138: 863–870 (1997)]. Even within the same organ, the distribution of ERα and ERβ can be compartmentalized. For example, in the mouse ovary, ERβ is highly expressed in the granulosa cells and ERα is restricted to the thecal and stromal cells [Sar and Welsch, Endocrinology 140: 963–971 (1999), Fitzpatrick, et al., Endocrinology 140: 2581–2591 (1999)]. However, there are examples where the receptors are coexpressed and there is evidence from in vitro studies that ERα and ERβ can form heterodimers [Cowley, et al., Journal of Biological Chemistry 272: 19858–19862 (1997)]. The most potent endogenous estrogen is 17β-estradiol. A large number of compounds have been described that either mimic or block the activity of 17β-estradiol. Compounds having roughly the same biological effects as 17β-estradiol are referred to as “estrogen receptor agonists”. Those which block the effects of 17β-estradiol, when given in combination with it, are called “estrogen receptor antagonists”. In reality there is a continuum between estrogen receptor agonist and estrogen receptor antagonist activity and indeed some compounds behave as estrogen receptor agonists in some tissues but estrogen receptor antagonists in others. These compounds with mixed activity are called selective estrogen receptor modulators (SERMS) and are therapeutically useful agents (e.g. EVISTA) [McDonnell, Journal of the Society for Gynecologic Investigation 7: S10–S15 (2000), Goldstein, et al., Human Reproduction Update 6: 212–224 (2000)]. The precise reason why the same compound can have cell-specific effects has not been elucidated, but the differences in receptor conformation and/or in the milieu of coregulatory proteins have been suggested. It has been known for some time that estrogen receptors adopt different conformations when binding ligands. However, the consequence and subtlety of these changes only recently has been revealed. The three dimensional structures of ERα and ERβ have been solved by co-crystallization with various ligands and clearly show the repositioning of helix 12 in the presence of an estrogen receptor antagonist, which sterically hinders the protein sequences required for receptor-coregulatory protein interaction [Pike, et al., Embo 18: 4608–4618 (1999), Shiau, et al., Cell 95: 927–937 (1998)]. In addition, the technique of phage display has been used to identify peptides that interact with estrogen receptors in the presence of different ligands [Paige, et al., Proceedings of the National Academy of Sciences of the United States of America 96: 3999–4004 (1999)]. For example, a peptide was identified that distinguished between ERα bound to the full estrogen receptor agonists 17β-estradiol and diethylstilbesterol. A different peptide was shown to distinguish between clomiphene bound to ERα and ERβ. These data indicate that each ligand potentially places the receptor in a unique and unpredictable conformation that is likely to have distinct biological activities. 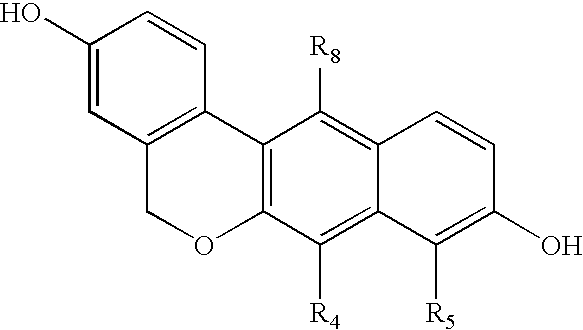 R4 is hydrogen, C1–C6 alkyl, halogen, C1–C6 alkoxy, —CN, C2–C8 alkenyl, —CHO, aryl, furyl, thienyl, pyrimidinyl, and pyridinyl; provided that at least one of R1–R8 is other than H; or a pharmaceutically acceptable salt thereof. In another aspect, the invention is directed to a pharmaceutical composition comprising at least one of the above compounds. In yet other aspects, the invention is drawn to the use of the above compounds in the treatment or prevention of diseases. This invention provides compounds of formula I. In some embodiments, the aryl group is an optionally substituted phenyl or naphthyl. In other embodiments, it is preferred that R5, R7, and R8 are each, independently, hydrogen or halogen; and R4 is hydrogen, alkyl of 1–6 carbon atoms, alkoxy of 1–6 carbon atoms, halogen, alkenyl of 2–8 carbon atoms, —CN, furyl, thienyl or pyridinyl. In yet other preferred embodiments, R5, R7, and R8 are each, independently, hydrogen or halogen; R4 is a hydrogen, alkyl of 1–6 carbon atoms, alkoxy of 1–6 carbon atoms, halogen, alkenyl of 2–7 carbon atoms, —CN, furyl, thienyl and pyridinyl; and R1, R2, R3, and R6 are each, independently, hydrogen, halogen, or hydroxyl. It is most preferred, in yet other embodiments, that R5, R7 and R8 are each, independently, hydrogen or halogen; R4is hydrogen, alkyl of 1–6 carbon atoms, alkoxy of 1–6 carbon atoms, halogen, alkenyl of 2–7 carbon atoms, —CN, furyl, thienyl and pyridinyl; R1, R2, R3, and R6 are each, independently, hydrogen, halogen, or hydroxyl; and at least one of R1, R2, R3, and R6 is hydroxyl. Pharmaceutically acceptable salts can be formed from organic and inorganic acids, for example, acetic, propionic, lactic, citric, tartaric, succinic, fumaric, maleic, malonic, mandelic, malic, phthalic, hydrochloric, hydrobromic, phosphoric, nitric, sulfuric, methanesulfonic, naphthalenesulfonic, benzenesulfonic, toluenesulfonic, camphorsulfonic, and similarly known acceptable aids when a compound of this invention contains a basic moiety. Salts may also be formed from organic and inorganic bases, such as alkali metal salts (for example, sodium, lithium, or potassium) alkaline earth metal salts, ammonium salts, alkylammonium salts containing 1–6 carbon atoms or dialkylammonium salts containing 1–6 carbon atoms in each alkyl group, and trialkylammonium salts containing 1–6 carbon atoms in each alkyl group, when a compound of this invention contains an acidic moiety. The term “alkyl”, as used herein, whether used alone or as part of another group, e.g., alkoxy, arylalkyl, alkoxycarbonyl, refers to a substituted or unsubstituted aliphatic hydrocarbon chain and includes, but is not limited to, straight and branched chains containing from 1 to 12 carbon atoms, preferably 1 to 6 carbon atoms, unless explicitly specified otherwise. For example, methyl, ethyl, propyl, isopropyl, butyl, i-butyl and t-butyl are encompassed by the term “alkyl.” Specifically included within the definition of “alkyl” are those aliphatic hydrocarbon chains that are optionally substituted. 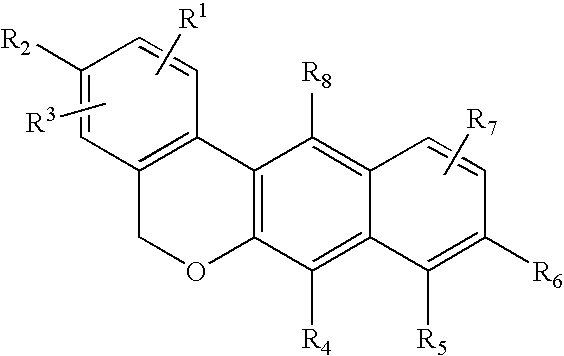 The carbon number as used in the definitions herein refers to carbon backbone and carbon branching, but does not include carbon atoms of the substituents, such as alkoxy substitutions and the like. 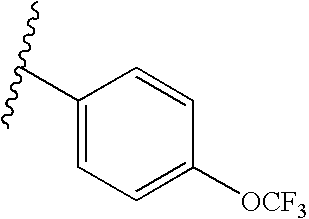 “Aryl,” as used herein as a group or part of a group, refers to an optionally substituted aromatic 5- to 13-membered mono- or bi-carbocyclic ring such as phenyl or naphthyl. Preferably, groups containing aryl moieties are monocyclic having 5 to 7 carbon atoms in the ring. Phenyl is one preferred aryl. In some embodiments, phenyl moieties are optionally substituted with C1–C6 alkyl, C2–C7 alkenyl, halogen, hydroxyl, C1–C6 alkoxy, —CN, —NO2, amino, C1–C6 alkylamino, dialkylamino of 1–6 carbon atoms per alkyl group, thio, C1–C6 alkylthio, C1–C6 alkylsulfinyl, C1–C6 alkylsulfonyl, C2–C7 alkoxycarbonyl, of 2–7 carbon atoms, alkylcarbonyl of 2–7 carbon atoms, trifluoroalkxoy, benzylnitrile or benzoyl. Heteroaryl as a group or part of a group means an aromatic 5- to 13-membered carbon containing mono- or bi-cyclic ring having one to five heteroatoms that independently may be nitrogen, oxygen or sulfur. Preferably, groups containing heteroaryl moieties are monocyclic having 5 to 7 members in the ring where one to two of the ring members are selected independently from nitrogen, oxygen or sulfur. Groups containing aryl or heteroaryl moieties may optionally be substituted as defined below or unsubstituted. Examples of heteroaryls include, but are not limited to, thienyl, furyl, pyrrolyl, imidazolyl, pyrazolyl, oxazolyl, isoxazolyl, thiazolyl, isothiazolyl, pyridyl, pyrazinyl, pyrimidinyl, pyridazinyl, indolyl, indazolyl, benzofuranyl, isobenzofuranyl, benzothienyl, isobenzothienyl, quinolyl, isoquinolyl, quinoxalinyl, or quinazolinyl. An optionally substituted substituent described herein, such as alkyl, alkenyl, aryl, or heteroaryl, may be substituted with one or more substituents, e.g 1–5 or 1–3. Suitable optionally substituents may be selected independently from nitro, cyano, —N(R11)(R12), halo, hydroxy, carboxy, alkyl, alkenyl, alkynyl (e.g., of 2–7 carbon atoms), cycloalkyl (e.g., of 5–8 carbon atoms), aryl, heteroaryl, alkoxy, aryloxy, heteroaryloxy, alkylalkoxy, alkoxycarbonyl, alkoxyalkoxy, perfluoroalkyl, perfluoroalkoxy, arylalkyl, alkylaryl, hydroxyalkyl, alkoxyalkyl, alkylthio, alkylsulfinyl, alkylsulfonyl, —S(O)2—N(R11)(R12), —C(═O)—N(R11)(R12), (R11)(R12)N-alkyl, (R11)(R12)N-alkoxyalkyl, (R11)(R12)N-alkylaryloxyalkyl, —S(O)s-aryl (where s=0–2), or —S(O)s-heteroaryl (where s=0–2); wherein R11 and R12 are each, independently, hydrogen, unsubstituted (C1–C6)alkyl, unsubstituted (C3–C7)cycloalkyl, aryl, aryl-(C1–C3)alkyl, aryloxy-(C1–C3)alkyl, arylthio-(C1–C3)alkyl, heteroaryl, heteroaryl-(C1–C3)alkyl, heteroaryloxy-(C1–C3)alkyl, or heteroarylthio-(C1–C3)alkyl groups; or if optionally taken together may be linked as an -alkylene-group to form a ring, e.g., of 3–8 ring members. In certain embodiments of the invention, preferred substitutents for alkyl, alkenyl, alkynyl and cycloalkyl include nitro, cyano, —N(R11)(R12), halo, hydroxyl, aryl, heteroaryl, alkoxy, alkoxyalkyl, and alkoxycarbonyl. In certain embodiments of the invention, preferred substituents for aryl and heteroaryl include —N(R11)(R12), alkyl, halo, perfluoroalkyl, perfluoroalkoxy, arylalkyl and alkylaryl. 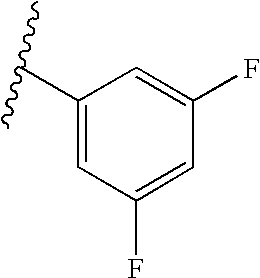 Examples of substituted alkyl and alkenyl moieties include 1-bromo vinyl, 1-fluoro vinyl, 1,2-difluoro 2,2-difluorovinyl, 1,2,2-trifluorovinyl, 1,2-dibromo ethane, 1,2 difluoro ethane, 1-fluoro-2-bromo ethane, CF2CF3, CF2CF2CF3, and the like. The term “lower alkyl” refers to an alkyl group having 1 to 6 carbon atoms, in some embodiments 1 to 3 carbon atoms are preferred. “Alkoxy,” as used herein, refers to the group R—O— where R is an alkyl group as defined above. The term “lower alkoxy,” as used herein, refers to the group R—O— where R is an alkyl group of 1 to 6 carbon atoms. In some embodiments, an R having 1 to 3 carbon atoms are preferred. 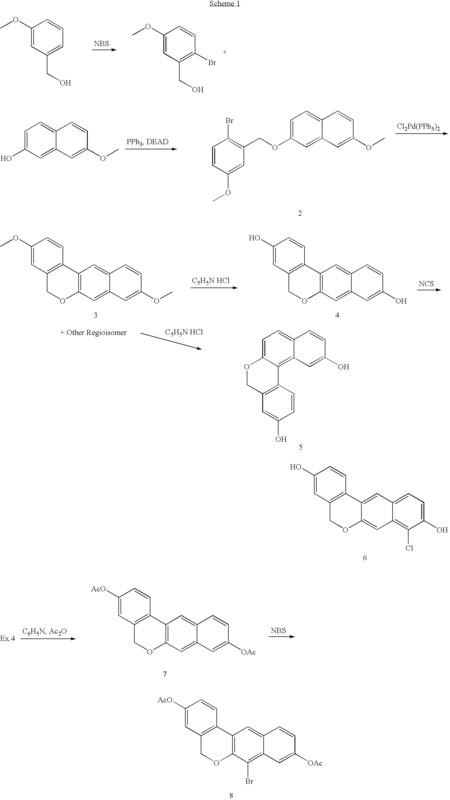 The compounds of this invention can be used as estrogen receptor modulators useful in the treatment or inhibition of conditions, disorders, or disease states that are at least partially mediated by an estrogen deficiency or excess, or which may be treated or inhibited through the use of an estrogenic agent. The compounds of this invention are particularly useful in treating a peri-menopausal, menopausal, or postmenopausal patient in which the levels of endogenous estrogens produced are greatly diminished. Menopause is generally defined as the last natural menstrual period and is characterized by the cessation of ovarian function, leading to the substantial diminution of circulating estrogen in the bloodstream. As used herein, menopause also includes conditions of decreased estrogen production that may be surgically, chemically, or be caused by a disease state which leads to premature diminution or cessation of ovarian function. Accordingly, the compounds of this invention can be used in treating or inhbiting osteoporosis and in the inhibition of bone demineralization, which may result from an imbalance in a individual's formation of new bone tissues and the resorption of older tissues, leading to a net loss of bone. Such bone depletion results in a range of individuals, particularly in post-menopausal women, women who have undergone bilateral oophorectomy, those receiving or who have received extended corticosteroid therapies, those experiencing gonadal dysgenesis, and those suffering from Cushing's syndrome. Special needs for bone, including teeth and oral bone, replacement can also be addressed using these compounds in individuals with bone fractures, defective bone structures, and those receiving bone-related surgeries and/or the implantation of prosthesis. In addition to those problems described above, these compounds can be used in treatment or inhibition for osteoarthritis, hypocalcemia, hypercalcemia, Paget's disease, osteomalacia, osteohalisteresis, multiple myeloma and other forms of cancer having deleterious effects on bone tissues. The preparation of several representative examples of this invention are described in the following Schemes 1–6. The present invention will now be illustrated by reference to the following specific, non-limiting examples. 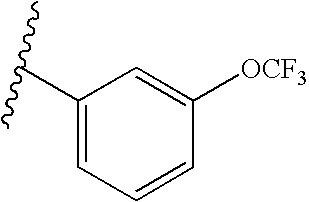 The title compound was prepared by reacting 3-methoxybenzyl alcohol (13.82 g, 0.1 mol) and NBS (19.58 g, 0.11 mol) in acetonitrile (250 mL) at room temperature for 3 hr. The solvent was removed and the resulting mass slurried in dichloromethane (250 mL) and filtered to remove the insoluble succinimide side product. 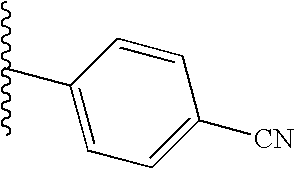 The crude material was purified by chromatography (20% EtOAc-hexanes) to provide a white solid (17.69 g, 81%), mp 57–58° C.
To a solution of 7-methoxy-2-naphthol (26.92 g, 0.15 moles), 2-bromo-5-methoxybenzyl alcohol (33.58 g, 0.15 moles), and triphenylphosphine (39.3 g, 0.15 moles) in anhydrous THF (500 mls) was added a solution of DEAD (26.10 g, 0.15 moles) in THF (100 mL) dropwise over 0.5 hr. The solution was stirred at room temperature overnight and, upon evaporation of half the volume, the product precipitated in good purity. The solid was filtered and rinsed with THF, then dried to yield 32.96 g (59%) of a white solid: mp 156–157° C.; 1H NMR (DMSO-d6): δ 3.77 (3H, s), 3.86 (3H, s), 5.18 (2H, s), 6.92 (1H, dd, J=3.2 Hz, J=8.7 Hz), 7.00 (1H, dd, J=2.4 Hz, J=8.7 Hz), 7.09 (1H, dd, J=2.4 Hz, J=8.9 Hz), 7.22 (1H, d, J=3.2 Hz), 7.25 (1H, d, J=2.4 Hz), 7.35 (1H, d, J=2.4 Hz), 7.59 (1H, d, J=8.7 Hz), 7.74 (1H, d, J=8.7 Hz), 7.76(1H, d, J=8.7 Hz); MS m/z 373/375 ([M+H]+). Calc'd: C, 61.14; H, 4.59. Found: C, 61.29; H, 4.21. A mixture of 2-[(2-bromo-5-methoxybenzyl)oxy]-7-methoxynaphthalene (9.35 g, 25 mmol), dichlorobis(triphenylphosphine) palladium (1.75 g, 2.5 mmol), and sodium acetate (6.15 g, 75 mmol) in anhydrous dimethylacetamide (500 mL) was stirred at 130° C. under nitrogen for two days. After cooling, the catalyst was filtered off and the dimethylacetamide removed under vacuum. The residue was slurried in methanol (200 mL) and the desired product was isolated by filtration to afford 2.9 g (40%) of a tan solid: mp 190–191° C.; 1H NMR (DMSO-d6): δ 3.81 (3H, s), 3.85 (3H, s), 5.14 (2H, s), 6.92 (1H, d, J=2.6 Hz), 7.00–7.03 (2 H, m), 7.18 (1H, d, J=2.4 Hz), 7.29 (1H, s), 7.79 (1H, d, J=9.0 Hz), 7.92 (1H, d, J=8.7 Hz), 8.26 (1H, s); MS m/z 293 ([M+H]+). Calc'd: C, 78.06; H, 5.52. Found: C, 77.95; H, 5.34. The above cyclization also supplied the undesired regioisomer, which was obtained from the methanol filtrate. The undesired regioisomer was not obtained pure and was demethylated as explained below for Example 4. 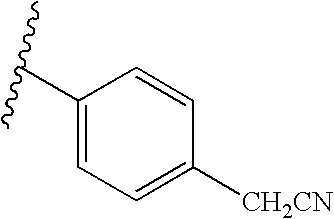 To pyridinium hydrochloride (30 g, 0.26 mol) at 190° C. was added 3,9-dimethoxy-H-dibenzo[c,g]chromene (7.0 g, 23.9 mmol). The solution was stirred at 190° C. for 3.5 hr and the mixture was cooled to near room temperature. The mixture was poured into water (300 mL) and stirred as a solid precipitated. This solid was filtered, washed well with water and dried. 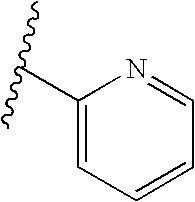 Purification by chromatography (50% ethyl acetate-hexanes) yielded 5.0 g (79%) of a white solid: mp 231–233° C.; 1H NMR (DMSO-d6): δ 5.05 (2H, s), 6.68 (1H, d, J=2.3 Hz), 6.83 (1H, dd, J=2.4 Hz, J=8.4 Hz), 6.90 (1H, dd, J=2.3 Hz, J=8.7 Hz), 6.93 (1H, d, J=2.3 Hz), 6.96 (1H, d, J=2.1 Hz), 7.13 (1H, s), 7.71 (1H, d, J=8.8 Hz), 7.78 (1H, d, J=8.5 Hz), 9.70 (2H, s); MS m/z 265 ([M+H]+). Calc'd: C, 77.26; H, 4.58. Found: C: 77.00; H: 4.31. The mixture of the other regioisomer and the desbromo-coupled product was subjected to the same demethylation conditions according to Example 2. The crude product was purified by chromatography (50% ethyl acetate-hexanes) to provide a tan solid 0.45 g (1%): mp 199–201° C.; 1H NMR (DMSO-d6): δ 4.93 (2H, s), 6.83 (1H, d, J=2.5 Hz), 6.89 (1H, dd, J=2.5 Hz, J=8.4 Hz), 6.95–6.99 (2H, m), 7.63 (1H, d, J=8.7 Hz), 7.73–7.81(3H, m), 9.75 (2H, s); MS m/z 265 ([M+H]+). An. HPLC showed 98.9% purity @ 254 nm. Calc'd: C, 76.22; H, 4.67. Found: C, 76.43; H, 4.49. A solution of H-dibenzo[c,g]chromene-3,9-diol (0.20 g, 0.76 mmoles) and N-chlorosuccimide (0.12 g, 0.91 mmoles) in THF (20 ml) was stirred at room temperature for 48 hours. The reaction solution was concentrated onto Florosil and purified by silica chromatography (30% ethyl acetate-hexanes) to yield 0.14 g (62%) of a tan solid. This material was further purified by reverse phase preparative HPLC to yield the title compound as an off white solid: mp 212–214° C.; 1H NMR (DMSO-d6): δ 5.12 (2H, s), 6.70 (1H, d, J=2.37 Hz), 6.85 (1H, dd, J=2.43 Hz, J=8.46 Hz), 7.13 (1H, d, J=9.06 Hz), 7.39 (1H, s), 7.73 (1H, d, J=8.91 Hz), 7.82 (1H, d, J=8.53 Hz), 8.24 (1H, s), 9.81 (1H, s), 10.39 (1H, s); MS (ESI) m/z 297/299 ([M−H]−). Calc'd: C, 68.35; H, 3.71. Found: C, 68.17; H, 3.65. To a mixture of pyridine (35 mL) and acetic anhydride (35 mL) was added (H-dibenzo[c,g]chromene-3,9-diol) (5.0 g, 18.9 mmol) and the mixture stirred at room temperature. After about an hour a precipitate formed and stirring was continued for another 5 hrs. The mixture was filtered and the product washed with ethyl acetate. 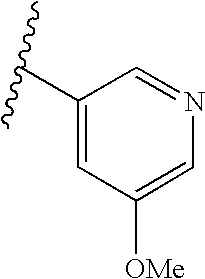 The crude product was purified by chromatography (25% ethyl acetate-hexanes) to provide a white solid (5.0 g, 76%): mp 194–195° C.; 1H NMR (DMSO-d6): δ 2.31 (3H, s), 2.33 (3H, s), 5.20 (2H, s), 7.16 (1H, d, J=1.9 Hz), 7.19 (1H, dd, J=2.4 Hz, J=8.8 Hz), 7.25 (1H, dd, J=2.5 Hz, J=8.3 Hz), 7.44 (1H, s), 7.54 (1H, d, J=2.4 Hz), 7.95 (1H, d, J=9.3 Hz), 8.09 (1H, d, J=8.3 Hz), 8.50 (1H, s); MS m/z 349 ([M+H]+). Calc'd: C, 72.41; H, 4.63. Found: C, 72.06; H, 4.48. To a mixture of N-bromosuccimide (3.1 g, 17.2 mmol) in anhydrous acetonitrile (400 mL) was added 3-(acetyloxy)-H-dibenzo[c,g]chromen-9-yl acetate (5.0 g, 14.4 mmol). The reaction mixture was stirred at room temperature overnight. The solid was filtered, washed with acetonitrile and dried to give 5.9 g (96%) of light tan solid. 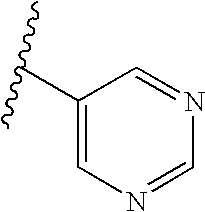 A sample of this solid was purified by chromatography (methylene chloride) to give a white solid: mp 224–226° C.; 1H NMR (DMSO-d6): δ 2.32 (3H, s), 2.35 (3H, s), 5.35 (2H, s), 7.19 (1H, d, J=2.4 Hz), 7.28 (1H, dd, J=2.4 Hz, J=8.3 Hz), 7.31 (1H, dd, J=2.0 Hz, J=8.8 Hz), 7.75 (1H, d, J=2.4 Hz), 8.05 (1H, d, J=8.8 Hz), 8.12 (1H, d, J=8.8 Hz), 8.59 (1H, s); MS m/z 427/429 ([M+H]+). Calc'd: C, 59.04; H, 3.54. Found: C, 58.87; H, 3.34. To a solution of 7-methoxy-2-naphthol in acetonitrile (100 mL) at ice bath temperature was added N-chlorosuccimide (1.61 g, 12.07 mmol). The reaction mixture was allowed to stir for 2 hrs at ice bath temperature and another 0.1 equiv. of N-chlorosuccimide was added. The reaction was allowed to warm to room temperature over 1 hr and poured into water (180 mL) and extracted with ethyl acetate (2×300 mL). The organic layer was washed with brine and dried over anhydrous magnesium sulfate, filtered and the solvent removed under vacuum. Ether was added and the insoluble impurities were filtered. 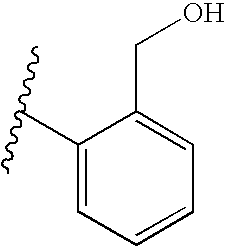 The mother liquor was concentrated and chromatographed (1:4, ethyl acetate-hexanes) to afford a light yellow solid: mp 76–78° C. An HPLC revealed product to be 98.0% pure (230 nm). Calc'd: C, 63.32; H, 4.35. Found: C, 63.12; H, 4.25. 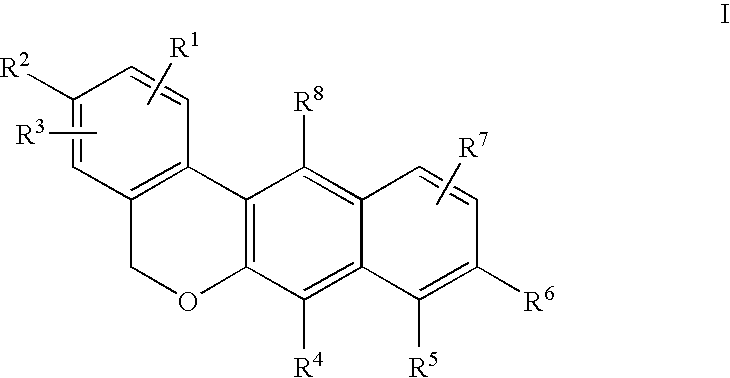 To a solution of Example 7 (3.05 g, 14.6 mmol), 2-bromo-5-methoxybenzyl alcohol (3.49 g, 16.08 mmol), and triphenylphosphine (4.22 g, 16.08 mmol) in dry THF (50 mL) at room temperature was slowly added DEAD (2.8 g, 16.08 mmol) over 15 minutes. After stirring 40 minutes, the THF was evaporated and the crude product was triturated with methanol to afford 5.31 g of white solid product (89%): mp 126–127° C.
Calc'd: C, 55.98; H, 3.96. Found: C, 55.86; H, 4.01. A mixture of Example 8 (3.12 g, 7.66 mmol), sodium acetate (1.88 g, 23.0 mmol) and dichlorobis(triphenylphosphine) palladium (1.61 g, 2.3 mmol) in dimethyacetamide (220 mL) was heated at 130° C. for 3 hrs. The solvent was removed under high vacuum and the catalyst filtered through florisil using methylene dichloride. The solid was washed with methylene dichloride-methanol (1:2) to afford 2.59 g of product. The mother liquor was concentrated and chromatographed (10% ethyl acetate-hexane) and washed with methanol to afford another 160 mg of product as a white solid. Total yield 2.75 g (74.5%): mp 166–168° C.
Calc'd: C, 69.84; H, 4.63. Found: C, 69.59; H, 4.32. A mixture of Example 9 (2.25 g, 6.92 mmol) and pyridiumium hydrochloride (21.9 g, 162 mmol) was heated to 184° C. for 2 hrs. The reaction mixture was allowed to cool and poured into water (300 mL) and extracted with ethyl acetate (2×200 mL), washed with brine and dried over anhydrous magnesium sulfate. The solvent was removed and the product was chromatographed (40% ethyl acetate-hexanes) to afford a white solid which was triturated with methylene chloride (25 mL) to afford 1.2 g (58%); mp 230–231° C.
Found: C, 68.02; H, 3.57. To a mixture of 7-bromo-3-(acetyloxy)-H-dibenzo[c,g]chromen-9-yl acetate (427 mg, 1 mmol) in methanol (25 mL) was added 25% sodium methoxide in methanol (6 mL). The reaction was stirred at room temperature for 0.5 hr, then diluted with ethyl acetate (300 mL) and 1 N HCl (150 mL). The ethyl acetate portion was washed with water (2×100 mL) and brine (150 mL), then dried over anhydrous magnesium sulfate and filtered. The solvent was removed under vacuum and the solid obtained was purified by chromatography (25% ethyl acetate-hexanes) to provide a yellow solid (286 mg, 83%): mp dec. above 260° C.; 1H NMR (DMSO-d6): δ 5.19 (2H, s), 6.70 (1H, d, J=2.4 Hz), 6.86 (1H, dd, J=2.4 Hz, J=8.5 Hz), 6.99 (1H, dd, J=2.3 Hz, J=8.8 Hz), 7.31 (1H, d, J=2.3 Hz), 7.79 (1H, d, J=6.3 Hz), 7.81 (1H, d, J=6.0 Hz), 8.22 (1H, s), 9.97 (2H, br s); MS m/z 343/345 ([M+H]+). Calc'd: C, 59.50; H, 3.23. Found: C, 59.22; H, 3.29. To a mixture of 3-(acetyloxy)-7-bromo-H-dibenzo[c,g]chromen-9-yl acetate (855 mg, 2 mmol) and anhydrous dimethylformamide (20 mL) was added copper cyanide (1.0 g, 10 mmol). The mixture was heated to 150° C. and maintained overnight. The mixture was cooled and suspended between ethyl acetate and water. The layers were separated, the ethyl acetate portion washed with water (3×50 mL) and brine (50 mL). The ethyl acetate was dried over anhydrous magnesium sulfate, the solvent removed and the resulting solid dissolved in methanol (10 mL) and 25% sodium methoxide added (3 mL). After stirring for 0.5 hr, ethyl acetate (50 mls) and 1 N HCl (20 mL) were added, the layers separated and the organic portion washed with water (3×30 mL) and brine (30 mL). After drying over anhydrous magnesium sulfate, the solvent was removed to provide a dark yellow solid, which was purified by chromatography (25% ethyl acetate-hexanes) to afford a pale yellow solid (208 mg, 36%): mp>280° C.; 1H NMR (DMSO-d6): δ 5.32 (2H, s), 6.71 (1H, d, J=2.4 Hz), 6.87 (1H, dd, J=2.4 Hz, J=8.3 Hz), dd, J=2.4 Hz, J=8.9 Hz), 7.18 (1H, d, J=2.4 Hz), 7.84 (1H, d, J=8.8 Hz), 7.87 (1H, d, J=8.8 Hz), 8.50 (1H, s), 9.90 (1H, br s), 10.32 (1H, br s); MS m/z 288 ([M−H]−). An. HPLC gave purity of 98.5% @254 nm. Calc'd: C, 72.48; H, 4.05; N, 4.70. Found: C, 72.31; H, 3.96; N, 4.55. To a mixture of 3-(acetyloxy)-7-bromo-H-dibenzo[c,g]chromen-9-yl acetate (427 mg, 1 mmol), CuBr (143 mg, 1 mmol) and anhydrous DMF (6 mL) was added 25% NaOMe/methanol (3 mL). The mixture was heated to 120° C. for 1 hr. The reaction mixture was cooled and ethyl acetate (100 mL) and 1 N HCl (50 mL) added. The layers were separated and the organic portion washed with water (3×50 mL) and brine (50 mL) then dried over anhydrous magnesium sulfate. The solvent was evaporated and the crude product purified by chromatography (25% ethyl acetate-hexanes) to yield a yellow solid (260 mg, 88%): mp dec 240° C.; 1H NMR (DMSO-d6): δ 3.88 (3H, s), 5.09 (2H, s), 6.70 (1H, d, J=2.4 Hz), 6.83 (1H, dd, J=2.4 Hz, J=8.3 Hz), 6.93 (1H, dd, J=2.4 Hz, J=8.8 Hz), 7.19 (1H, d, J=2.4 Hz), 7.72 (1H, d, J=8.5 Hz), 7.77 (1H, d, J=8.8 Hz), 7.92 (1H, s), 9.75 (2H, s); MS m/z 295 ([M+H]+). Calc'd: C, 73.46 H, 4.79. Found: C, 73.19 H, 4.62. To a mixture of 3-(acetyloxy)-7-bromo-H-dibenzo[c,g]chromen-9-yl acetate (300 mg, 0.7 mmol), anhydrous toluene (2 mL) and tributylvinyltin (254 mg, 0.8 mmol) was added tetrakis(triphenylphosphine)palladium (160 mg, 0.14 mmol). The mixture was heated to reflux and held for 4.5 hr. The reaction mixture was cooled and diluted with water and ethyl acetate and the organic portion washed with water and brine. After drying over anhydrous magnesium sulfate and removing the solvent, the crude material was treated with methanol (10 mL) and 25% sodium methoxide (2 mL). The mixture was stirred for 0.5 hr, then ethyl acetate (50 mL) and 1 N HCl (20 mL) were added. The organic portion separated and washed with water ( 2×20 mL) and brine (25 mL) and dried over anhydrous magnesium sulfate. 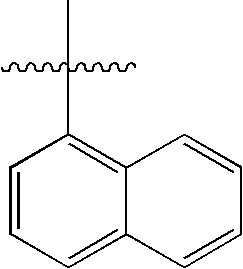 Removal of the solvent gave a solid which was purified by chromatography (25% ethyl acetate-hexanes) to yield a tan solid (45 mg, 15%): mp dec 195–197° C.; 1H NMR (DMSO-d6): δ 5.07 (2H, s), 5.66–5.76 (2H, m), 6.69 (1H, d, J=2.4 Hz), 6.84 (1H, dd, J=2.5 Hz, J=8.4 Hz), 6.91–7.04 (2H, m), 7.34 (1H, d, J=2.4 Hz), 7.74 (1H, d, J=8.9 Hz), 7.78 (1H, d, J=8.6 Hz), 8.10 (1H, s), 9.72 (2H, s); MS m/z 291 ([M+H]+). Cal'd: C, 77.64; H, 4.94. Found: C, 77.63; H, 4.81. To a mixture of pyridine (8 mL) and acetic anhydride (8 mL) was added 7-methoxy-H-dibenzo[c,g]chromene-3,9-diol (1.37 g, 4.7 mmol) and the mixture stirred at room temperature for 2 hr. The insoluble solid was filtered and rinsed with 10% ethyl acetate-hexanes to provide a tan solid (1.6 g, 90%). 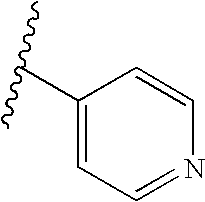 A portion of this solid was purified by chromatography (2.5% acetonitrile-methylene chloride) to obtain a white solid: mp 165–167° C.; 1H NMR (DMSO-d6): δ 2.31 (3H, s), 2.33 (3H, s), 3.95 (3H, s), 5.24 (2H, s), 7.18 (1H, d, J=2.4 Hz), 7.22 (1H, dd, J=2.4 Hz, J=8.8 Hz), 7.25 (1H, dd, J=2.4 Hz, J=8.8 Hz), 7.67 (1H, d, J=2.4 Hz), 7.96 (1H, d, J=8.8 Hz), 8.08 (1H, d, J=8.8 Hz), 8.28 (1H, s); MS m/z 379 ([M+H]+). An. HPLC showed purity of 99.8% @ 280 nm. Cal'd: C, 68.85; H, 4.88. Found: C, 68.93; H, 4.72. 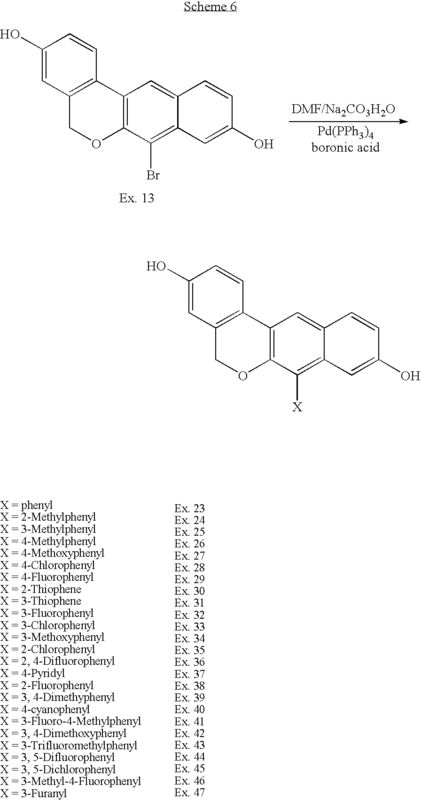 To a mixture of 3-(acetyloxy)-12-bromo-7-methoxy-H-dibenzo[c,g]chromen-9-yl acetate (570 mg, 1.5 mmol) in anhydrous acetonitrile (100 mL) was added N-bromosuccimide (350 mg, 1.95 mmol) and the reaction mixture stirred at room temperature for 1 hr. The solvent was removed and the crude residue purified by chromatography (25% ethyl acetate-hexanes) to afford a pale yellow solid (500 mg, 73%): mp 176–177° C.; 1H NMR (DMSO-d6): δ 2.33 (3H, s), 2.35 (3H, s), 3.96 (3H, s), 5.12 (2H, s), 7.30 (1H, d, J=2.9 Hz), 7.31 (1H, s), 7.42 (1H, dd, J=2.4 Hz, J=9.3 Hz), 7.80 (1H, d, J=2.4 Hz), 8.35 (1H, d, J=9.3 Hz), 8.54 (1H, dd, J=2.0 Hz, J=7.6 Hz). Calc'd: C, 57.79; H, 3.75. Found: C, 57.54; H, 3.63. To a mixture of 3-(acetyloxy)-12-bromo-7-methoxy-H-dibenzo[c,g]chromen-9-yl acetate (260 mg, 0.57 mmol) in methanol (25 mL) was added 25% sodium methoxide in methanol (3 mL) and the mixture was stirred for 0.5 hr. The reaction mixture was suspended between ethyl acetate (50 mL) and 1 N HCl (20 mL) and the organic portion washed with water (3×50 mL) then brine (50 mL). The ethyl acetate was dried over anhydrous magnesium sulfate and the solvent removed to afford a tan solid, which was purified by silica gel chromatography (50% ethyl acetate-hexanes) to yield 95 mg (45%) of a tan solid: mp dec above 250° C.; 1H NMR (DMSO-d6): δ 3.89 (3H, s), 4.97 (2H, s), 6.82 (1H, d, J=2.4 Hz), 6.88 (1H, dd, J=2.7 Hz, J=8.5 Hz), 7.17 (1H, dd, J=2.4 Hz, J=9.3 Hz), 7.29 (1H, d, J=2.4 Hz), 8.12 (1H, d, J=9.3 Hz), 8.29 (1H, d, J=8.3 Hz), 9.93 (1H, s), 10.06 (1H, s); MS m/z 373/375 ([M+H]+). Found: C, 57.64 ; H,3.34. To a mixture of 3-(acetyloxy)-7-methoxy-H-dibenzo[c,g]chromen-9-yl acetate (290 mg, 0.77 mmol) in anhydrous THF (10 mL) was added N-chlorosuccimide (133 mg, 1.0 mmol). The reaction mixture was stirred at room temperature for 3 hr. The solvent was removed and methanol (10 mL) and. 25% sodium methoxide-methanol (3 mL) was added. After stirring at room temperature for 0.5 hr, ethyl acetate (25 mL) and 1 N HCl (10 mL) was added, the mixture shaken, the layers separated and the ethyl acetate washed with water (3×10 mL) and brine (10 mL). The mixture was dried over anhydrous magnesium sulfate, the solvent removed and the crude tan solid purified by silica gel chromatography (25% ethyl acetate-hexanes) to afford 166 mg (66%) of a white solid: mp dec 240° C.; 1H NMR (DMSO-d6): δ 3.89 (3H, s), 4.99 (2H, s), 6.82 (1H, d, J=2.4 Hz), 6.88 (1H, dd, J=2.4 Hz, J=8.8 Hz), 7.12 (1H, dd, J=2.4 Hz, J=8.8 Hz), 7.29 (1H, d, J=2.4 Hz), 8.11 (1H, d, J=9.3 Hz), 8.27 (1H, d, J=8.3 Hz), 10.00 (2H, br s); MS m/z 329/331 ([M+H]+), 1 Cl. An. HPLC gave purity of 99.6% @ 280 nm. Calc'd: C, 65.05; H, 4.06. Found: C, 65.21; H, 4.12. To a mixture of 7-bromo-H-dibenzo[c,g]chromene-3,9-diol (343 mg, 1 mmol), anhydrous dimethyformamide (10 mL), and dichlorobis(tri-o-tolylphosphine)palladium (79 mg, 0.1 mmol) was added tetramethyltin (268 mg, 1.5 mmol). The reaction mixture was heated to 80° C. and maintained for 3 hr. TLC and MS analysis showed a 1:1 mixture of starting material to product. The mixture was cooled to room temperature and additional tetramethyltin (268 mg, 1.5 mmol) and catalyst (79 mg, 0.1 mmol) added. The mixture was heated overnight at 80° C. The reaction mixture was cooled and ethyl acetate (50 mL) and water (25 mL) added. After separating the layers, the organic portion was washed with water (3×20 mL), then brine (20 mL) and dried over anhydrous magnesium sulfate. The solvent was removed and the crude product purified by chromatography (25% ethyl acetate-hexanes), giving a pale yellow solid (117 mg, 42%): mp 224–226° C.; 1H NMR (DMSO-d6): δ 2.38 (3H, s), 5.06 (2H, s), 6.69 (1H, d, J=2.4 Hz), 6.83 (1H, dd, J=2.5 Hz, J=8.4 Hz), 6.93 (1H, dd, J=2.3 Hz, J=8.7 Hz), 7.08 (1H, d, J=2.3 Hz), 7.71 (1H, d, J=8.8 Hz), 7.77 (1H, d, J=8.6 Hz), 8.01 (1H, s), 9.67 (2H, s); MS m/z 279 ([M+H]+). An. HPLC gave purity of 99.5% @ 280 nm. Calc'd: C, 76.69; H, 5.15. Found: C, 76.61; H, 4.99. To a mixture of 3-(acetyloxy)-7-bromo-H-dibenzo[c,g]chromen-9-yl acetate (2.03 g, 4.8 mmol), (2-hydroxymethylphenyl) boronic acid dihydrate (1.54 g, 13.3 mol), potassium carbonate (2.07 g, 15 mmol), dimethoxyethane (100 mL), and water (10 mL) was added tetrakis(triphenylphosphine) palladium (600 mg, 0.4 mmol). The mixture was heated to reflux for 1 hr. The reaction mixture was cooled and suspended between ethyl acetate (200 mL) and water (75 mL). The ethyl acetate was washed with water (2×75 mL), followed by brine (75 mL) and dried over anhydrous magnesium sulfate. The solvent was removed and the resulting yellow liquid was dissolved in methanol (100 mL) and 25% sodium methoxide (10 mL) added. The mixture was stirred at room temperature for 0.5 hr, then diluted with ethyl acetate (200 mL) and 1 N HCl (75 mL). The ethyl acetate was washed with water (3×75 mL), then brine (75 mL) and dried over anhydrous magnesium sulfate. 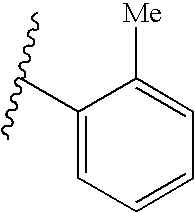 The solvent was removed providing a tan solid, which was purified by chromatography (35% ethyl acetate-hexanes) to afford a white solid (500 mg, 15%): mp 171–173° C.; 1H NMR (DMSO-d6): δ 4.08 (1H, dd, J=3.7 Hz, J=14.3 Hz), 4.26 (1H, dd, J=3.6 Hz, J=14.3 Hz), 4.92 (2H, s), 4.94–4.99(1H, m), 6.36 (1H, d, J=2.0 Hz), 6.63 (1H, d, J=2.1 Hz), 6.85 (1H, dd, J=2.3 Hz, J=8.5 Hz), 6.89 (1H, dd, J=2.3 Hz, J=8.7 Hz), 7.11 (1H, d, J=7.4 Hz), 7.36–7.39 (1H, m), 7.45–7.49 (1H, m), 7.67 (1H, d, J=7.7 Hz), 7.78 (1H, d, J=8.9 Hz), 7.83 (1H, d, J=8.6 Hz),8.20 (1H, s), 9.53 (1 H, br s), 9.70 (1H, br s); MS m/z 369 ([M−H]−). An. HPLC gave purity of 94.9% @ 280 nm. Cal'd: C, 76.71; H, 4.99. Found: C, 76.56; H, 4.95. To a mixture of 7-bromo-H-dibenzo[c,g]chromene-3,9-diol (343 mg, 1 mmol), dimethylacetamide (5 mL), 2 M sodium carbonate (1 mL), water (1 mL), and tetrakis(triphenylphosphine)palladium (116 mg, 0.1 mmol) was added phenylboronic acid (366 mg, 3 mmol). The reaction mixture was heated to 120° C. for 3 hr. The reaction mixture was cooled and diluted with ethyl acetate (25 mL) and 5% ammonium chloride. The organic layer was washed with water (3×10 mL) and brine (10 mL) and dried over anhydrous magnesium sulfate. The solvent was removed and the resulting dark liquid was purified by chromatography (5% acetonitrile-dichloromethane) to afford a tan solid (170 mg, 50%): mp 225–227° C.; 1H NMR (DMSO-d6): δ 4.95 (2H, s), 6.63 (2H, s), 6.85 (1H, dd, J=2.2 Hz, J=8.4 Hz), 6.92(1H, dd, J=2.2 Hz, J=8.7 Hz), 7.33 (2H, d, J=7.0 Hz), 7.40–7.43 (1H, m), 7.49–7.53 (2H, m), 7.77 (1H, d, J=8.9 Hz), 7.83 (1H, d, J=8.6 Hz), 8.19 (1H, s), 9.61 (1H, br s ), 9.69 (1H, br s); MS m/z 341 ([M+H]+). An. HPLC gave purity of 98.2% @ 280 nm. Calc'd: C, 79.07; H, 4.90. Found: C, 78.68; H, 4.64. To a mixture of 7-bromo-H-dibenzo[c,g]chromene-3,9-diol (343 mg, 1 mmol), dimethylformamide (5 mL), 2 M sodium carbonate (1 mL), water (1 mL), and tetrakis(triphenylphosphine)palladium (116 mg, 0.1 mmol) was added 2-tolylboronic acid (400 mg, 3 mmol). The reaction mixture was heated to 120° C. for 2.5 hr then cooled and diluted with ethyl acetate (25 mL) and 5% ammonium chloride. The organic layer was washed with water (3×10 mL) and brine (10 mL) and dried over anhydrous magnesium sulfate. The solvent was removed and the resulting dark solid was purified by chromatography (5% acetonitrile-dichloromethane) to afford a yellow solid (150 mg, 42%): mp 193–196° C.; 1H NMR (DMSO-d6): δ 1.97 (3H, s), 4.92 (2H, s), 6.36 (1H, d, J=2.3 Hz), 6.62 (1H, d, J=2.4 Hz), 6.83–6.92 (2H, m), 7.09–7.13 (1H, m), 7.27–7.39 (3H, m), 7.78 (1H, d, J=8.9 Hz), 7.84 (1H, d, J=8.6 Hz), 8.20 (1H, s), 9.52 (1H, s), 9.72 (1H, s); MS m/z 355 ([M+H]+). An. HPLC gave purity of 99.8% @ 280 nm. Calc'd: C, 79.32; H, 5.27. Found: C, 79.04; H, 5.15. To a mixture of 7-bromo-H-dibenzo[c,g]chromene-3,9-diol (343 mg, 1 mmol), dimethylformamide (5 mL), 2 M sodium carbonate (1 mL), water (1 mL), and tetrakis(triphenylphosphine)palladium (116 mg, 0.1 mmol) was added 3-tolylboronic acid (400 mg, 3 mmol). The reaction mixture was heated to 120° C. for 2 hr, then cooled and diluted with ethyl acetate (25 mL) and 5% ammonium chloride. The organic layer was washed with water (3×10 mL) and brine (10 mL) and dried over anhydrous magnesium sulfate The solvent was removed and the resulting dark oil was purified by chromatography (5% acetonitrile-dichloromethane) to afford a white solid (264 mg, 75%): mp 219–222° C.; 1H NMR (DMSO-d6): δ 2.39 (3H, s), 4.94 (2H, s), 6.61–6.64 (2H, m), 6.84 (1H, dd, J=2.4 Hz, J=8.5 Hz), 6.90 (1H, dd, J=2.3 Hz, J=8.8 Hz), 7.09–7.12 (2H, m), 7.22 (1H, d, J=9.1 Hz), 7.39–7.43 (1H, m), 7.77 (1H, d, J=8.9 Hz), 7.82 (1H, d, J=8.6 Hz), 8.18 (1H, s), 9.54 (1H, br s), 9.72 (1H, s); MS m/z 355 ([M+H]+). An. HPLC gave purity of 99.3% @ 254 nm. Calc'd: C, 80.93; H, 5.15. Found: C, 80.81; H, 5.08. To a mixture of 7-bromo-H-dibenzo[c,g]chromene-3,9-diol (343 mg, 1 mmol), dimethylformamide (5 mL), 2 M sodium carbonate (1 mL), water (1 mL), and tetrakis(triphenylphosphine)palladium (116 mg, 0.1 mmol) was added 4-tolylboronic acid (400 mg, 3 mmol). The reaction mixture was heated to 120° C. for 1 hr. The reaction mixture was cooled and diluted with ethyl acetate (25 mL) and 5% ammonium chloride. The organic layer was washed with water (3×10 mL) and brine (10 mL) and dried over anhydrous magnesium sulfate. 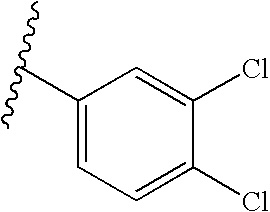 The solvent was removed and the resulting dark oil was purified by chromatography (5% acetonitrile-dichloromethane) to afford a white solid (265 mg, 75%): mp 238–240° C.; 1H NMR (DMSO-d6): δ 2.40 (3H, s), 4.93 (2H, s), 6.64 (2H, dd, J=2.3 Hz, J=7.0 Hz), 6.84 (1H, dd, J=2.4 Hz, J=8.5 Hz), 6.90 (1H, dd, J=2.3 Hz, J=8.8 Hz), 7.20 (2H, d, J=8.0 Hz), 7.31 (2H, d, J=8.0 Hz), 7.76 (1H, d, J=8.9 Hz), 7.82 (1H, d, J=8.6 Hz), 8.17 (1H, s), 9.54 (1H, br s), 9.71 (1H, br s); MS m/z 355 ([M+H]+). An. HPLC gave purity of 99.9% @ 280 nm. Calc'd: C, 80.16; H, 5.21. Found: C, 79.99; H, 5.12. To a mixture of 7-bromo-H-dibenzo[c,g]chromene-3,9-diol (343 mg, 1 mmol), dimethylformamide (5 mL), 2 M sodium carbonate (1 mL), water (1 mL), and tetrakis(triphenylphosphine)palladium (116 mg, 0.1 mmol) was added 4-methoxyphenylboronic acid (500 mg, 3 mmol). The reaction mixture was heated to 120° C. for 1 hr, then cooled and diluted with ethyl acetate (25 mL) and 5% ammonium chloride. The organic layer was washed with water (3×10 mL) and brine (10 mL) and dried over anhydrous magnesium sulfate. 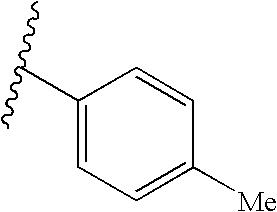 The solvent was removed and the resulting brown solid was purified by chromatography (25% ethyl acetate-hexanes) to afford a white solid (215 mg, 58%): mp 200–203° C.; 1H NMR (DMSO-d6): δ 3.85 (3H, s), 4.95 (2H, s), 6.64 (1H, d, J=2.4 Hz), 6.68 (1H, d, J=2.4 Hz), 6.85 (1H, dd, J=2.6 Hz, J=8.4 Hz), 6.91 (1H, dd, J=2.2 Hz, J=8.8 Hz), 7.08 (2H, d, J=8.8 Hz), 7.25 (2H, d, J=8.8 Hz), 7.77 (1H, d, J=8.7 Hz), 7.82 (1H, d, J=8.8 Hz), 8.17 (1H, s), 9.50 (1H, s), 9.69 (1H, s); MS m/z 371 ([M+H]+). An. HPLC gave purity of 98.3% @ 254 nm. Cal'd: C, 77.07; H, 4.96. Found: C, 76.81; H, 5.00. To a mixture of 7-bromo-H-dibenzo[c,g]chromene-3,9-diol (343 mg, 1 mmol), dimethylformamide (5 mL), 2 M sodium carbonate (1 mL), water (1 mL), and tetrakis(triphenylphosphine)palladium (116 mg, 0.1 mmol) was added 4-chlorophenylboronic acid (468 mg, 3 mmol). The reaction mixture was heated to 120° C. for 1.5 hr then cooled and diluted with ethyl acetate (25 mL) and 5% ammonium chloride. The organic layer was washed with water (3×10 mL) and brine (10 mL) and dried over anhydrous magnesium sulfate. 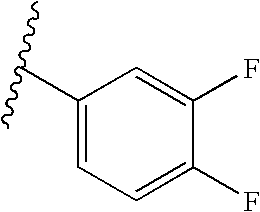 The solvent was removed and the resulting dark oil was purified by chromatography (25% ethyl acetate-hexanes) to afford a white solid (215 mg, 58%): mp 239–242° C.; 1H NMR (DMSO-d6): δ 4.96 (2H, s), 6.60 (1H, d, J=2.3 Hz), 6.64 (1H, d, J=2.4 Hz), 6.84 (1H, dd, J=2.3 Hz, J=8.8 Hz), 6.92 (1H, dd, J=2.5 Hz, J=8.5 Hz), 7.36 (2H, d, J=8.5 Hz), 7.58 (2H, d, J=8.4 Hz), 7.78 (1H, d, J=8.9 Hz), 7.83 (1H, d, J=8.6 Hz), 8.21 (1H, s), 9.56 (1H, s), 9.72 (1H, s); MS m/z 375/377 ([M+H]+). An. HPLC gave purity of 99.6% @ 280 nm. Calc'd: C, 73.00; H, 4.10. Found: C, 72.89; H, 4.01. To a mixture of 7-bromo-H-dibenzo[c,g]chromene-3,9-diol (343 mg, 1 mmol), dimethylformamide (5 mL), 2 M sodium carbonate (1 mL), water (1 mL), and tetrakis(triphenylphosphine)palladium (116 mg, 0.1 mmol) was added 4-fluorophenylboronic acid (420 mg, 3 mmol). The reaction mixture was heated to 120° C. for 2 hr, then cooled and diluted with ethyl acetate (25 mL) and 5% ammonium chloride. The organic layer was washed with water (3×10 mL) and brine (10 mL) and dried over anhydrous magnesium sulfate. The solvent was removed and the resulting tan solid was purified by chromatography (25% ethyl acetate-hexanes) to afford a white solid (215 mg, 62%): mp 229–232° C.; 1H NMR (DMSO-d6): δ 4.96 (2H, s), 6.62 (2H, dd, J=2.4 Hz, J=9.4 Hz), 6.84 (1H, dd, J=2.5 Hz, J=8.5 Hz), 6.92 (1H, dd, J=2.4 Hz, J=8.8 Hz), 7.33–7.43 (4H, m), 7.78 (1H, d, J=8.8 Hz), 7.83 (1H, d, J=8.5 Hz), 8.20 (1H, s), 9.56 (1H, s), 9.72 (1H, s); MS m/z 359 ([M+H]+). An. HPLC gave purity of 98.1% @ 280 nm. Calc'd: C, 75.94; H, 4.32. Found: C, 76.02; H, 4.29. To a mixture of 7-bromo-H-dibenzo[c,g]chromene-3,9-diol (343 mg, 1 mmol), DMF (5 mL), water (1 mL), 2 N sodium carbonate (1 mL ) and tetrakis(triphenyl-phosphine)-palladium (116 mg, 0.1 mmol) was added 2-thiopheneboronic acid (260 mg, 2 mmol). The reaction mixture was heated to 120° C. and maintained overnight. The mixture was cooled, and ethyl acetate (50 mL) and 5% ammonium chloride (25 mL) added. The ethyl acetate was washed with water (2×20 mL) and brine (20 mL) and dried over anhydrous magnesium sulfate. After removing the solvent, the crude solid was purified by chromatography (25% ethyl acetate-hexanes) to afford a pale yellow solid (84 mg, 24%): mp 233–236° C.; 1H NMR (DMSO-d6): δ 5.01 (2H, s), 6.65 (1H, d, J=2.5 Hz), 6.83–6.88 (2H, m), 6.93 (1H, dd, J=2.3 Hz, J=8.8 Hz), 7.09 (1H, dd, J=1.0 Hz, J=3.4 Hz), 7.24 (1H, dd, J=3.5 Hz, J=5.1 Hz), 7.70 (1H, dd, J=1.0 Hz, J=5.1 Hz), 7.78 (1H, d, J=8.8 Hz), 7.83 (1H, d, J=8.7 Hz), 8.24 (1H, s), 9.67 (1H s), 9.75 (1H, s); MS m/z 347 ([M+H]+). An. HPLC gave purity of 96.8% @ 300 nM. Cal'd: C, 72.06; H, 4.15. Found: C, 71.82; H, 4.0.1. To a mixture of 7-bromo-H-dibenzo[c,g]chromene-3,9-diol (343 mg, 1 mmol), dimethylformamide (5 mL), 2 M sodium carbonate (1 mL), water (1 mL), and tetrakis(triphenylphosphine)palladium (116 mg, 0.1 mmol) was added 3-thiopheneboronic acid (300 mg, 3 mmol). The reaction mixture was heated to 120° C. for 1 hr. The reaction mixture was cooled and diluted with ethyl acetate (25 mL) and 5% ammonium chloride. The organic layer was washed with water (3×10 mL) and brine (10 mL) and dried over anhydrous magnesium sulfate. The solvent was removed and the resulting dark liquid was purified by chromatography (5% acetonitrile-dichloromethane) to afford a yellow solid (188 mg, 54%): mp 159-161° C.; 1H NMR (DMSO-d6): δ 4.98 (2H, s), 6.65 (1H, d, J=2.5 Hz), 6.83–6.86 (2H, m), 6.92(1H, dd, J=2.4 Hz, J=8.7 Hz), 7.18 (1H, dd, J=1.2 Hz, J=4.9 Hz), 7.50 (1H, dd, J=1.2 Hz, J=4.9 Hz), 7.68 (1H, dd, J=2.9 Hz, J=4.9 Hz), 7.76 (1H, d, J=8.8 Hz), 7.82 (1H, d, J=8.6 Hz), 8.17 (1H, s), 9.57 (1H, s), 9.70 (1H, s); MS m/z 345 ([M−H]−). An. HPLC gave purity of 99.8% @ 280 nm. Calc'd: C, 70.97; H, 4.25. Found: C, 71.06; H, 3.98. To a mixture of 7-bromo-H-dibenzo[c,g]chromene-3,9-diol (343 mg, 1 mmol), dimethylformamide (5 mL), 2 M sodium carbonate (1 mL), water (1 mL), and tetrakis(triphenylphosphine)palladium (116 mg, 0.1 mmol) was added 3-fluorophenylboronic acid (420 mg, 3 mmol). The reaction mixture was heated to 120° C. for 1 hr, then cooled and diluted with ethyl acetate (25 mL) and 5% ammonium chloride. The organic layer was washed with water (3×10 mL) and brine (10 mL) and dried over anhydrous magnesium sulfate. 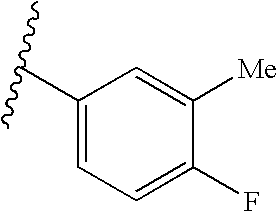 The solvent was removed and the resulting dark liquid was purified by chromatography (25% ethyl acetate-hexanes) to afford a white solid (196 mg, 55%): mp 225–227° C.; 1H NMR (DMSO-d6): δ 4.98 (2H, s), 6.62–6.64 (2H, m), 6.84 (1H, dd, J=2.4 Hz, J=8.5 Hz), 6.92 (1H, dd, J=2.3 Hz, J=8.8 Hz), 7.16–7.29 (3H, m), 7.52–7.59 (1H, m), 7.77–7.85 (2H, m), 8.22 (1H, s), 9.59 (1H, s), 9.72 (1H, s); MS m/z 359 ([M+H]+). An. HPLC gave purity of 99.2% @ 210 nm. Calc'd: C, 76.32; H, 4.29. Found: C, 76.21; H, 4.22. To a mixture of 7-bromo-H-dibenzo[c,g]chromene-3,9-diol (343 mg, 1 mmol), dimethylformamide (5 mL), 2 M sodium carbonate (1 mL), water (1 mL), and tetrakis(triphenylphosphine)palladium (116 mg, 0.1 mmol) was added 3-chlorophenylboronic acid (468 mg, 3 mmol). The reaction mixture was heated to 120° C. for 1 hr, then cooled and diluted with ethyl acetate (25 mL) and 5% ammonium chloride. The organic layer was washed with water (3×10 mL) and brine (10 mL) and dried over anhydrous magnesium sulfate. 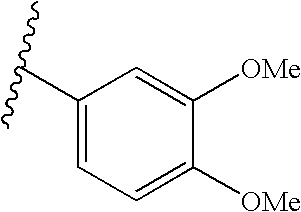 The solvent was removed and the resulting dark liquid was purified by chromatography (2.5% acetonitrile-dichloromethane) to afford a white solid (138.6 mg, 37%): mp 243–246° C.; 1H NMR (DMSO-d6): δ 4.98 (2H, s), 6.59 (1H, d, J=2.3 Hz), 6.64 (1H, d, J=2.4 Hz), 6.84 (1H, dd, J=2.5 Hz, J=8.4 Hz), 6.93 (1H, dd, J=2.3 Hz, J=8.8 Hz), 7.29–7.32 (1H, m), 7.38–7.41 (1H, m), 7.45–7.58 (2H, m), 7.77–7.85 (2H, m), 8.22 (1H, s), 9.61 (1H, s), 9.73 (1H,s); MS m/z 375/377, 1 Cl, ([M+H]+). An. HPLC gave purity of 97.5% @ 280 nm. Calc'd: C, 73.70; H, 4.03. Found: C, 73.84; H, 4.15. To a mixture of 7-bromo-H-dibenzo[c,g]chromene-3,9-diol (343 mg, 1 mmol), dimethylformamide (5 mL), 2 M sodium carbonate (1 mL), water (1 mL), and tetrakis(triphenylphosphine)palladium (116 mg, 0.1 mmol) was added 3-methoxyphenylboronic acid (456 mg, 3 mmol). The reaction mixture was heated to 120° C. for 1 hr, then cooled and diluted with ethyl acetate (25 mL) and 5% ammonium chloride. The organic layer was washed with water (3×10 mL) and brine (10 mL) and dried over anhydrous magnesium sulfate. 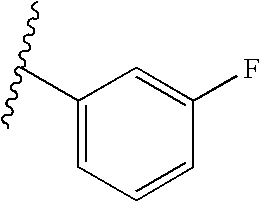 The solvent was removed and the resulting dark solid was purified by chromatography (2.5% acetonitrile-dichloromethane) to afford a white solid (248.3 mg, 67%): mp 220–223° C.; 1H NMR (DMSO-d6): δ 3.79 (3H, s), 4.96 (2H, s), 6.64 (2H, dd, J=2.3 Hz, J=7.0 Hz), 6.82–6.92 (4H, m), 6.98 (1H, dd, J=1.5 Hz, J=6.7 Hz), 7.40–7.45 (1H, m), 7.75–7.84 (2H, m), 8.19 (1H, s), 9.54 (1H, s), 9.70 (1H, s); MS fn/z 371 ([M+H]+). An. HPLC gave purity of 98.5% @ 280 nm. Calc'd: C, 76.71; H, 4.99. Found: C, 76.88; H, 4.80. To a mixture of 7-bromo-H-dibenzo[c,g]chromene-3,9-diol (343 mg, 1 mmol), dimethylformamide (5 mL), 2 M sodium carbonate (1 mL), water (1 mL), and tetrakis(triphenylphosphine)palladium (116 mg, 0.1 mmol) was added 2-chlorophenylboronic acid (468 mg, 3 mmol). The reaction mixture was heated to 120° C. for 1 hr, then cooled and diluted with ethyl acetate (25 mL) and 5% ammonium chloride. The organic layer was washed with water (3×10 mL) and brine (10 mL) and dried over anhydrous magnesium sulfate. 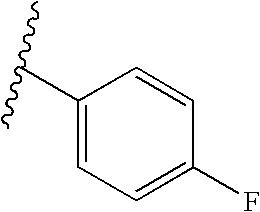 The solvent was removed and the resulting dark liquid was purified by chromatography (2.5% acetonitrile-dichloromethane) to afford a white solid (85.1 mg, 22%): mp 220–222° C.; 1H NMR (DMSO-d6): δ 4.98 (2H, s), 6.37 (1H, d, J=2.3 Hz), 6.63 (1H, d, J=2.4 Hz), 6.85 (1H, dd, J=2.5 Hz, J=8.5 Hz), 6.92 (1H, dd, J=2.4 Hz, J=8.8 Hz), 7.33–7.38 (1H, m), 7.43–7.53 (2H, m), 7.61–7.67 (1H, m), 7.78–7.85 (2H, m), 8.24 (1H, s), 9.58 (1H, s), 9.72 (1H, s); MS m/z 375/377, 1 Cl, ([M+H]+). An. HPLC gave purity of 97.6% @ 280 nm. Calc'd: C, 72.65; H, 4.14. Found: C, 72.63; H, 3.83. To a mixture of 7-bromo-H-dibenzo[c,g]chromene-3,9-diol (343 mg, 1 mmol), dimethylformamide (5 mL), 2 M sodium carbonate (1 mL), water (1 mL), and tetrakis(triphenylphosphine)palladium (116 mg, 0.1 mmol) was added 3,4-difluorophenylboronic acid (474 mg, 3 mmol). The reaction mixture was heated to 120° C. for 2 hr, then cooled and diluted with ethyl acetate (25 mL) and 5% ammonium chloride. The organic layer was washed with water (3×10 mL) and brine (10 mL) and dried over anhydrous magnesium sulfate. The solvent was removed and the resulting tan solid was purified by chromatography (2.5% acetonitrile-dichloromethane) to afford a white solid (162.1 mg, 43%): mp 235–237° C.; 1H NMR (DMSO-d6): δ 4.99 (2H, s), 6.63 (2H, dd, J=2.4 Hz, J=8.8 Hz), 6.84 (1H, dd, J=2.5 Hz, J=8.4 Hz), 6.93 (1H, dd, J=2.3 Hz, J=8.8 Hz), 7.16–7.21 (1H, m), 7.42–7.49 (1H, m), 7.53–7.62 (1H, m), 7.77–7.84 (2H, m), 8.23 (1H, s), 9.60 (1H, s), 9.73 (1H, s); MS m/z 377 ([M+H]+). An. HPLC gave purity of 97.6% @ 280 nm. Calc'd: C, 73.05; H, 3.78. Found: C, 72.98; H, 3.63. To a mixture of 7-bromo-H-dibenzo[c,g]chromene-3,9-diol (343 mg, 1 mmol), dimethylformamide (5 mL), 2 M sodium carbonate (1 mL), water (1 mL), and tetrakis(triphenylphosphine)palladium (116 mg, 0.1 mmol) was added 4-pyridylboronic acid (370 mg, 3 mmol). The reaction mixture was heated to 120° C. for 2 hr, then cooled and diluted with ethyl acetate (25 mL) and 5% ammonium chloride. The insoluble tan solid was filtered and dried, then dissolved in dichloromethane:methanol and filtered through filter aid to remove catalyst. The solvent was removed to afford a tan solid (60 mg, 18%): mp >250° C.; 1H NMR (DMSO-d6): δ 4.99 (2H, s), 6.60 (1H, d, J=2.2 Hz), 6.64 (1H, d, J=2.4 Hz), 6.85 (1H, dd, J=2.4 Hz, J=8.5 Hz), 6.94 (1H, dd, J=2.3 Hz, J=8.8 Hz), 7.40 (2H, dd, J=1.5 Hz, J=4.4 Hz), 7.79–7.85 (2H, m), 8.26 (1H, s), 8.71 (2H, dd, J=1.5 Hz, J=4.4 Hz), 9.65 (1H, s), 9.76 (1H.s); MS m/z 342 ([M+H]+). An. HPLC gave purity of 99.7% @280 nm. Calc'd: C, 69.94; H, 4.27; N, 3.71. Found: C, 70.27; H, 4.08; N, 3.58. To a mixture of 7-bromo-H-dibenzo[c,g]chromene-3,9-diol (343 mg, 1 mmol), dimethylformamide (5 mL), 2 M sodium carbonate (1 mL), water (1 mL), and tetrakis(triphenylphosphine)palladium (116 mg, 0.1 mmol) was added 2-fluorophenylboronic acid (420 mg, 3 mmol). The reaction mixture was heated to 120° C. for 2 hr, then cooled and diluted with ethyl acetate (25 mL) and 5% ammonium chloride. The organic layer was washed with water (3×10 mL) and brine (10 mL) and dried over anhydrous magnesium sulfate. The solvent was removed and the resulting dark liquid was purified by chromatography (2.5% acetonitrile-dichloromethane) to afford a white solid (120 mg, 30%): mp 240–242° C.; 1H NMR (DMSO-d6): δ 4.97 (2H, d, J=2.7 Hz), 6.55 (1H, s), 6.64 (1H, d, J=2.4 Hz), 6.85 (1H, dd, J=2.5 Hz, J=8.5 Hz), 6.93 (1H, dd, J=2.3 Hz, J=8.8 Hz), 7.33–7.43 (3H, m), 7.45–7.54 (1H, m), 7.78–7.85 (2H, m), 8.25 (1H, s), 9.62 (1H, s), 9.72 (1H, s); MS m/z 359 ([M+H]+). An. HPLC gave purity of 99.2% @ 280 nm. Calc'd: C, 75.20; H, 4.39. Found: C, 75.09; H, 4.22. To a mixture of 7-bromo-H-dibenzo[c,g]chromene-3,9-diol (343 mg, 1 mmol), dimethylformamide (5 mL), 2 M sodium carbonate (1 mL), water (1 mL), and tetrakis(triphenylphosphine)palladium (116 mg, 0.1 mmol) was added 3,4-dimethylphenylboronic acid (450 mg, 3 mmol). The reaction mixture was heated to 120° C. for 1 hr, then cooled and diluted with ethyl acetate (25 mL) and 5% ammonium chloride. The organic layer was washed with water (3×10 mL) and brine (10 mL) and dried over anhydrous magnesium sulfate. The solvent was removed and the resulting tan solid was purified by chromatography (2.5% acetonitrile-dichloromethane) to afford a white solid (95 mg, 26%): mp 218–221° C.; 1H NMR (DMSO-d6): δ 2.29 (3H, s), 2.31 (3H, s) 4.92 (2H, s),6.62–6.65 (2H, m), 6.82–6.91 (2H, m), 7.01–7.05 (1H, m), 7.08 (1H, s), 7.25 (1H, d, J=7.7 Hz), 7.77–7.83 (2H, m), 8.16 (1H, s), 9.48 (1H, s), 9.70 (1H, s); MS m/z 369 ([M+H]+). An. HPLC gave purity of 97.3% @ 280 nm. Calc'd: C, 80.71; H, 5.53. Found: C, 80.61; H, 5.43. To a mixture of 7-bromo-H-dibenzo[c,g]chromene-3,9-diol (400 mg, 1.2 mmol), dimethylformamide (5 mL), 2 M sodium carbonate (1 mL), water (1 mL), and tetrakis(triphenylphosphine)palladium (140 mg, 0.12 mmol) was added 4-cyanophenylboronic acid (514 mg, 3.5 mmol). The reaction mixture was heated to 120° C. for 1 hr, then cooled and diluted with ethyl acetate (25 mL) and 5% ammonium chloride. The organic layer was washed with water (3×10 mL) and brine (10 mL) and dried over anhydrous magnesium sulfate. The solvent was removed and the resulting dark liquid was purified by chromatography (2.5% acetonitrile-dichloromethane) to afford a white solid (282.3 mg, 66%): mp >250° C.; 1H NMR (DMSO-d6): δ 4.98 (2H, s), 6.55 (1H, d, J=2.2 Hz), 6.64 (1H, d, J=2.4 Hz), 6.85 (1H, dd, J=2.5 Hz, J=8.5 Hz), 6.94 (1H, dd, J=2.3 Hz, J=8.8 Hz), 7.57 (2H, d, J=8.3 Hz), 7.79–7.85 (2H, m), 7.98 (1H, d, J=7.8 Hz), 8.25 (1H, s), 9.62 (1H, s), 9.74 (1H, s); MS m/z 364 ([M−H]−). An. HPLC gave purity of 96.5% @ 280 nm. Calc'd: C, 77.74; H, 4.24; N, 3.78. Found: C, 77.91; H, 4.07; N, 3.53. To a mixture of 7-bromo-H-dibenzo[c,g]chromene-3,9-diol (343 mg, 1 mmol), dimethylformamide (5 mL), 2 M sodium carbonate (1 mL), water (1 mL), and tetrakis(triphenylphosphine)palladium (116 mg, 0.1 mmol) was added 3-fluoro-4-methylphenylboronic acid (462 mg, 3 mmol). The reaction mixture was heated to 120° C. for 1 hr, then cooled and diluted with ethyl acetate (25 mL) and 5% ammonium chloride. The organic layer was washed with water (3×10 mL) and brine (10 mL) and dried over anhydrous magnesium sulfate. 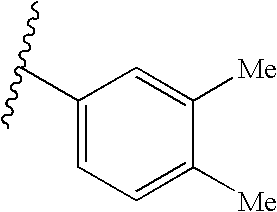 The solvent was removed and the resulting dark solid was purified by chromatography (2.5% acetonitrile-dichloromethane) to afford a white solid (226 mg, 61%): mp 238–240° C.; 1H NMR (DMSO-d6): δ 4.97 (2H, s), 6.63–6.65 (2H, m), 6.84 (1H, dd, J=2.5 Hz, J=8.5 Hz), 6.91 (1H, dd, J=2.4 Hz, J=8.8 Hz), 7.04–7.13 (2H, m), 7.38–7.43 (1H, m), 7.76–7.84 (2H, m), 8.20 (1H, s), 9.55 (1H, s), 9.72 (1H, s); MS m/z 373 ([M+H]+). An. HPLC gave purity of 98.2% @ 280 nm. Calc'd: C, 76.30; H, 4.70. Found: C, 76.04; H, 4.60. To a mixture of 7-bromo-H-dibenzo[c,g]chromene-3,9-diol (343 mg, 1 mmol), dimethylformamide (5 mL), 2 M sodium carbonate (1 mL), water (1 mL), and tetrakis(triphenylphosphine)palladium (116 mg, 0.1 mmol) was added 3-fluoro-4-methylphenylboronic acid (546 mg, 3 mmol). The reaction mixture was heated to 120° C. for 1 hr, then cooled and diluted with ethyl acetate (25 mL) and 5% ammonium chloride. The organic layer was washed with water (3×10 mL) and brine (10 mL) and dried over anhydrous magnesium sulfate. 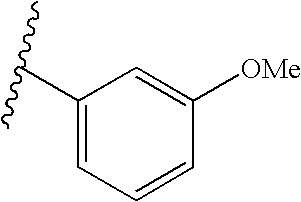 The solvent was removed and the resulting dark liquid was purified by chromatography (2.5% acetonitrile-dichloromethane) to afford a white solid (261.1 mg, 65%): mp 245–248° C.; 1H NMR (DMSO-d6): δ 3.75 (3H, s), 3.84 (3H, s), 4.96 (2H, s), 6.64 (1H, d, J=2.4 Hz), 6.75 (1H, dd, J=2.3 Hz), 6.83–6.92 (4H, m), 7.09 (1H, d, J=8.2 Hz), 7.74–7.83 (2H, m), 8.17 (1H, s), 9.51 (1H, s), 9.70 (1H, s); MS m/z 401 ([M+H]+). An. HPLC gave purity of 99.4% @ 280 nm. Calc'd: C, 73.34; H, 5.17. Found: C, 73.24; H, 4.95. To a mixture of 7-bromo-H-dibenzo[c,g]chromene-3,9-diol (343 mg, 1 mmol), dimethylformamide (5 mL), 2 M sodium carbonate (1 mL), water (1 mL), and tetrakis(triphenylphosphine)palladium (116 mg, 0.1 mmol) was added 3-fluoro-4-methylphenylboronic acid (570 mg, 3 mmol). The reaction mixture was heated to 120° C. for 1 hr, then cooled and diluted with ethyl acetate (25 mL) and 5% ammonium chloride. The organic layer was washed with water (3×10 mL) and brine (10 mL) and dried over anhydrous magnesium sulfate. 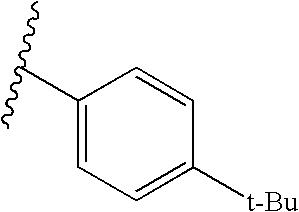 The solvent was removed and the resulting tan solid was purified by chromatography (2.5% acetonitrile-dichloromethane) to afford a white solid (214 mg, 52%): mp 228–231° C.; 1H NMR (DMSO-d6): δ 4.99 (2H, d, J=2.7 Hz), 6.55 (1H, d, J=2.2 Hz), 6.64 (1H, d, J=2.4 Hz), 6.85 (1H, dd, J=2.5 Hz, J=8.5 Hz), 6.94 (1H, dd, J=2.3 Hz, J=8.8 Hz), 7.66–7.86 (6 H, m), 8.25 (1H, s), 9.62 (1H, s), 9.73 (1H, s); MS m/z 409 ([M+H]+). An. HPLC gave purity of 100% @ 280 nm. Calc'd: C, 70.59; H, 3.70. Found: C, 70.23; H, 3.79. To a mixture of 7-bromo-H-dibenzo[c,g]chromene-3,9-diol (343 mg, 1 mmol), dimethylformamide (5 mL), 2 M sodium carbonate (1 mL), water (1 mL), and tetrakis(triphenylphosphine)palladium (116 mg, 0.1 mmol) was added 3,5-difluoro-phenylboronic acid (475 mg, 3 mmol). The reaction mixture was heated to 120° C. for 1.5 hr, then cooled and diluted with ethyl acetate (25 mL) and 5% ammonium chloride. The organic layer was washed with water (3×10 mL) and brine (10 mL) and dried over anhydrous magnesium sulfate. 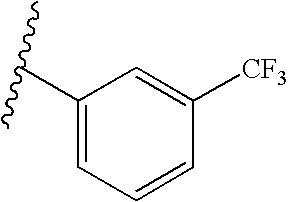 The solvent was removed and the resulting dark liquid was purified by chromatography (2.5% acetonitrile-dichloromethane) to afford a tan solid (217.4 mg, 58%): mp 238–240° C.; 1H NMR (DMSO-d6): δ 5.01 (2H, s), 6.63 (2H, dd, J=2.3 Hz, J=6.4 Hz), 6.84 (1H, dd, J=2.4 Hz, J=8.5 Hz), 6.94 (1H, dd, J=2.3 Hz, J=8.8 Hz), 7.08–7.14 (2H, m), 7.27–7.35 (1H, m), 7.78–7.84 (2 H, m), 8.24 (1H, s), 9.65 (1H, s), 9.75 (1H, s); MS m/z 375 ([M−H]−). An. HPLC gave purity of 97.5% @ 280 nm. Calc'd: C, 72.36; H, 3.85. Found: C, 72.31; H, 3.64. To a mixture of 7-bromo-H-dibenzo[c,g]chromene-3,9-diol (343 mg, 1 mmol), dimethylformamide (5 mL), 2 M sodium carbonate (1 mL), water (1 mL), and tetrakis(triphenylphosphine)palladium (116 mg, 0.1 mmol) was added 3,5-difluoro-phenylboronic acid (573 mg, 3 mmol). The reaction mixture was heated to 120° C. for 1 hr, then cooled and diluted with ethyl acetate (25 mL) and 5% ammonium chloride. The organic layer was washed with water (3×10 mL) and brine (10 mL) and dried over anhydrous magnesium sulfate. The solvent was removed and the resulting dark liquid was purified by chromatography (2.5% acetonitrile-dichloromethane) to afford a tan solid (178.9 mg, 44%): mp 252–255° C.; 1H NMR (DMSO-d6): δ 5.01 (2H, s), 6.57 (1H, d, J=2.3 Hz), 6.64 (1H, d, J=2.4 Hz), 6.84 (1H, dd, J=2.5 Hz, J=8.5 Hz), 6.94 (1H, dd, J=2.3 Hz, J=8.8 Hz), 7.42 (2H, d, J=1.9 Hz), 7.66–7.70 (1 H, m), 7.79–7.85 (2H, m), 8.25 (1H, s), 9.68 (1H, s), 9.76 (1H, s); MS m/z 409/411/413, 2 Cl ([M+H]+). An. HPLC gave purity of 97.6% @ 280 nm. Calc'd: C, 67.50; H, 3.45. Found: C, 67.13; H, 3.63. To a mixture of 7-bromo-H-dibenzo[c,g]chromene-3,9-diol (343 mg, 1 mmol), dimethylformamide (5 mL), 2 M sodium carbonate (1 mL), water (1 mL), and tetrakis(triphenylphosphine)palladium (116 mg, 0.1 mmol) was added 3-methyl-4-fluoro-phenylboronic acid (486 mg, 3 mmol). The reaction mixture was heated to 120° C. for 1 hr, then cooled and diluted with ethyl acetate (25 mL) and 5% ammonium chloride. The organic layer was washed with water (3×10 mL) and brine (10 mL) and dried over anhydrous magnesium sulfate. 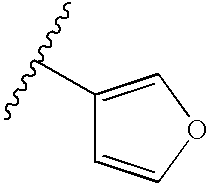 The solvent was removed and the resulting dark liquid was purified by chromatography (2.5% acetonitrile-dichloromethane) to afford a tan solid (223 mg, 60%): mp 185–188° C.; 1H NMR (DMSO-d6): δ 2.31 (3H, d, J=1.2 Hz), 4.95 (2H, s), 6.62 (2H, dd, J=2.3 Hz, J=10.4 Hz), 6.84 (1H, dd, J=2.4 Hz, J=8.5 Hz), 6.91 (1H, dd, J=2.3 Hz, J=8.8 Hz), 7.13–7.30 (3H, m), 7.76–7.84 (2H, m), 8.19 (1H, s), 9.55 (1H, s), 9.73 (1H, s); MS m/z 371 ([M−H]−). An. HPLC gave purity of 99.5% @ 280 nm. Calc'd: C, 77.41; H, 4.60. Found: C, 77.17; H, 4.54. A mixture of 7-bromo-5H-dibenzo[c,g]chromene-3,9-diol (342 mg, 1.0 mmol), furan-3-boronic acid (224 mg, 2 mmols) and tetrakis(triphenylphosphine)palladium(0) (116 mg, 0.1 mmoles) in DMF (20 ml) is heated at 120° C. with stirring for 4 h. The mixture was filtered through celite, extracted with ethyl acetate (×3), washed with brine, dried over sodium sulfate, filtered, stripped of solvent and purified by silica column chromatography (18%–25% ethyl acetate-hexane) to yield 200 mg (61%) of the title compound as a yellowish solid: mp 216–218° C.; 1H NMR (DMSO-d6): δ 5.00 (2H, s), 6.66 (2H, m), 6.84 (1H, dd, J=8.45 Hz, J=2.35 Hz), 6.93 (1H, dd, J=8.77 Hz, J=2.35 Hz), 7.04 (1H, d, J=2.17 Hz), 7.76 (1H, d, J=8.83 Hz), 7.80–7.85 (3H, m), 8.16 (1H, s), 9.61 (1H, s), 9.71 (1H, s); MS (ESI) m/z 329 (M−H)−, 331(M+H)+. 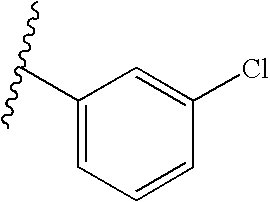 A mixture of 7-bromo-5H-dibenzo[c,g]chromene-3,9-diol (450 mg, 1.32 mmol), 2-(tributylstannyl)furan (0.622 ml, 1.97 mmols) and tetrakis(triphenylphosphine)palladium(0) (153 mg, 0.132 mmoles) in toluene (26 ml) is heated at 110° C. with stirring for 23 h. The mixture was filtered through celite, concentrated and purified by reverse-phase preparative HPLC to yield 280 mg (64%) of the title compound as a light brown solid. It is further purified by triturating with CH2Cl2 to yield a gray solid: mp 158–163° C.; 1H NMR (DMSO-d6): δ 5.04 (2H, s), 6.61 (1H, d, J=3.11 Hz), 6.67–6.69 (2H, m), 6.85 (1H, dd, J=8.47 Hz, J=2.33 Hz), 6.95 (1H, dd, J=8.72 Hz, J=2.27 Hz), 6.99 (1H, d, J=1.98 Hz), 7.77 (1H, d, J=8.77 Hz), 7.82 (1H, d, J=8.53 Hz), 7.85 (1H, d, J=1.32 Hz), 8.24 (1H, s), 9.70 (1H, s), 9.75 (1H, s); MS (ESI) m/z 329 (M−H)−, 331(M+H)+. Calc'd: C, 72.62; H, 4.06. Found: C, 72.67; H, 4.03. A mixture of 7-bromo-5H-dibenzo[c,g]chromene-3,9-diol (420 mg, 1.23 mmol), 2-tributylstannylthiazole (0.95 ml, 1.15 g, 3.07 mmols) and dichlorobis(tri-O-toylphosphine)palladium(II) (97 mg, 0.123 mmoles) in DMF (12 ml) is heated at 110° C. with stirring for 18 h. The mixture was filtered through celite, extracted with ethyl acetate (×3), washed with brine, dried over sodium sulfate, filtered, stripped of solvent and purified by silica column chromatography (25% ethyl acetate-hexane) to yield 200 mg (51%) of the title compound as a yellow solid. The analytical sample is further purified by another silica column chromatography (10%–20% ethyl acetate-hexane) to yield a yellowish solid. : mp 187–189° C.; 1H NMR (DMSO-d6): δ 0.94 (3H, t, J=7.17 Hz), 1.37–1.44 (2H, m), 1.47–1.58 (2H, m), 2.92 (2H, t, J=7.00 Hz), 5.04 (2H, s), 6.73 (1H, d, J=2.36 Hz), 6.82 (1H, dd, J=8.44 Hz, J=2.48 Hz), 6.92 (1H, dd, J=8.76 Hz, J=2.18 Hz), 7.12 (1H, d, J=2.05 Hz), 7.71 (1H, d, J=8.88 Hz ), 7.76 (1H, d, J=8.53 Hz), 8.00 (1H, s), 9.63 (1H, s), 9.67 (1H, s); MS (ESI) m/z 319 (M−H)−, 321 (M+H)+. Calc'd: C, 78.73; H, 6.29. Found: C, 78.42; H, 6.27. The title compound was prepared by reacting 7-bromo-H-dibenzo[c,g]chromene-3,9-diol (686 mg, 2 mmol) and 3-pyridinylboronic acid (737 mg, 6 mmol) as described above in Example 23 to afford a yellow solid (201 mg, 30%): mp >250° C.; 1H NMR (DMSO-d6): δ 4.99 (2H, s), 6.60 (1H, d, J=2.5 Hz), 6.65 (1H, d, J=2.5 Hz), 6.86 (2H, dd, J=8.5 Hz, J=2.6 Hz), 7.54–7.58 (1H, m), 7.78–7.85 (3H, m), 8.25 (1H, s), 8.55 (1H, d, J=1.4 Hz), 8.63 (1H, dd, J=4.8 Hz, J=1.6 Hz), 9.62 (1H, s), 9.72 (1H, s); MS m/z 342 ([M+H]+). An. HPLC gave purity of 99.6% @ 280 nm. Calc'd: C, 76.60; N, 4.50; H, 4.06. Found: C, 76.46; N, 4.53; H, 3.80. The title compound was prepared by reacting 7-bromo-H-dibenzo[c,g]chromene-3,9-diol (343 mg, 1 mmol) and 4-methoxy-3-pyridinylboronic acid (168 mg, 1.1 mmol) as described above in Example 23 to afford a yellow solid (62.3 mg, 17%): mp >220° C.; 1H NMR (DMSO-d6): δ 3.94 (3H, s) 4.98 (2H, s), 6.64–6.67 (2H, m), 6.83 (1H, dd, J=8.5 Hz, J=2.4 Hz), 6.93 (1H, dd, J=8.8 Hz, J=2.3 Hz), 6.98 (1H, d, J=8.5 Hz), 7.69 (1H, dd, J=8.5 Hz, J=2.4 Hz), 7.78–7.85 (2H, m), 8.13 (1H, d, J=2.2 Hz), 8.22 (1H, s), 9.60 (1H, s), 9.73 (1H, s); MS m/z 372 ([M+H]+). An. HPLC gave purity of 98.9% @ 280 nm. Calc'd: C, 73.67; N, 4.68; H, 3.74. Found: C, 73.71; N, 4.40; H, 3.34. The title compound was prepared by reacting 7-bromo-H-dibenzo[c,g]chromene-3,9-diol (343 mg, 1 mmol) and pyridinylboronic acid (370 mg, 3 mmol) as described above in Example 23 to afford a tan solid (84.8 mg, 25%): mp >250° C.; 1H NMR (DMSO-d6): δ 5.04 (2H, s), 6.62 (1H, d, J=2.3 Hz), 6.65 (1H, d, J=2.4 Hz), 6.85 (1H, dd, J=8.5 Hz, J=2.6 Hz), 6.97 (1H, dd, J=11.8 Hz, J=5.4 Hz), 7.82–7.86 (2H, m), 8.31 (1H, s), 8.87 (2H, s), 9.26 (1H, s), 9.73 (2H, br s); MS m/z 343 ([M+H]+). An. HPLC gave purity of 96.8% @ 300 nm. Calc'd: C, 72.53; N, 4.23; H, 8.06. Found: C, 72.48; N, 4.17; H, 7.68. The title compound was prepared by reacting 7-bromo-H-dibenzo[c,g]chromene-3,9-diol (515 mg, 1.5 mmol) and 5-methoxy-3-pyridinylboronic acid (306 mg, 3 mmol) as described above in Example 23 to afford a tan solid (160.4 mg, 29%): mp >250° C.; 1H NMR (DMSO-d6): δ 3.88 (3H, s), 5.00 (2H, s), 6.64 (2H, dd, J=6.2 Hz, J=2.4 Hz), 6.85 (1H, dd, J=8.5 Hz, J=2.6 Hz), 6.94 (1H, dd, J=8.8 Hz, J=2.3 Hz), 7.38 (1H, dd, J=2.9 Hz, J=1.7 Hz), 7.81–7.85 (2H, m), 8.14 (1H, s), 8.25 (1H, s), 8.36 (1H, s), 9.61 (1H, br s), 9.72 (1H, br s); MS m/z 372 ([M+H]+). An. HPLC gave purity of 99.0% @ 300 nm. Calc'd: C, 74.38; N, 4.61; H, 3.77. Found: C, 74.27; N, 4.49; H, 3.31. The title compound was prepared by reacting 7-bromo-H-dibenzo[c,g]chromene-3,9-diol (686 mg, 2 mmol) and 2-pyridinyltributyltin (306 mg, 3 mmol) as described above in Example 23 to afford a tan solid (46.9 mg, 7%): mp >220° C.; 1H NMR (DMSO-d6): δ 4.96 (2H, s), 6.57 (1H, d, J=2.3 Hz), 6.64 (1H, d, J=2.4 Hz), m), 7.47 (1H, dd, J=6.9 Hz, J=1.0 Hz), 7.78 (1H, d, J=8.8 Hz), 7.84 (1H, d, J=8.7 Hz), 7.90–7.94 (1H, m), 8.23 (1H, s), 8.75 (1H, d, J=2.4 Hz), 9.52 (1H, br s), 9.71 (1H, br s); MS m/z 342 ([M+H]+). An. HPLC gave purity of 99.0% @ 210 nm. Calc'd: C, 75.42; N, 4.60; H, 4.00. Found: C, 75.08; N, 4.20; H, 3.80. The title compound was prepared by reacting 7-bromo-H-dibenzo[c,g]chromene-3,9-diol (343 mg, 1 mmol) and 3,4-dichlorophenyl boronic acid (572 mg, 3 mmol) as described above in Example 23 to afford a white solid (220 mg, 54%): mp 143–145° C.; 1H NMR (DMSO-d6): δ 4.99 (2H, s), 6.57 (1H, d, J=2.4 Hz), 6.65 (1H, d, J=2.3 Hz), 6.84 (1H, dd, J=8.5 Hz, J=2.6 Hz), 6.93 (1H, dd, J=8.8 Hz, J=2.4 Hz), 7.35 (1H, dd, J=8.2 Hz, J=2.1 Hz), 7.62 (1H, d, J=1.9 Hz), 7.77–7.84 (3H, m), 8.24 (1H, s), 9.59 (1H, s), 9.72 (1H, s); MS m/z 407/409 ([M−H]−). An. HPLC gave purity of 97.7% @ 280 nm. Calc'd: C, 66.62; H, 3.55. Found: C, 66.40; H, 3.39. The title compound was prepared by reacting 7-bromo-H-dibenzo[c,g]chromene-3,9-diol (343 mg, 1 mmol) and 4-methylthiophenyl boronic acid (504 mg, 3 mmol) as described above in Example 23 to afford a tan solid (250 mg, 65%): mp 195–198° C.; 1H NMR (DMSO-d6): δ 2.56 (3H, s), 4.95 (2H, s), 6.65 (2H, dd, J=10.6, J=2.4 Hz), 6.84 (1H, dd, J=8.5, Hz J=2.6 Hz), 6.91 (1H, dd, J=8.8 Hz, J=2.4 Hz), 7.28 (2H, d, J=8.5 Hz), 7.39 (2H, d, J=8.5 Hz), 7.77 (1H, d, J=8.7 Hz), 7.82 (1H, d, J=8.6 Hz), 8.18 (1H, s), 9.52 (1H, s), 9.69 (1H, s); MS m/z 387 ([M+H]+). An. HPLC gave purity of 99.4% @ 280 nm. Calc'd: C, 73.56; H, 4.78. Found: C, 73.66; H, 4.43. The title compound was prepared by reacting 7-bromo-H-dibenzo[c,g]chromene-3,9-diol (343 mg, 1 mmol) and 4-cyanomethylphenyl boronic acid (483 mg, 3 mmol) as described above in Example 23 to afford a white solid (210 mg, 55%): mp 240–242° C.; 1H NMR (DMSO-d6): δ 4.14 (2H, s), 4.95 (2H, s), 6.63 (2H, d, J=2.3 Hz), 6.85 (1H, dd, J=8.5, Hz J=2.4 Hz), 6.92 (1H, dd, J=8.8 Hz, J=2.4 Hz), 7.36 (2H, d, J=8.2 Hz), 7.49 (2H, d, J=8.3 Hz), 7.78 (1H, d, J=8.9 Hz), 7.83 (1H, d, J=8.6 Hz), 8.20 (1H, s), 9.55 (1H, s), 9.70 (1H, s); MS nm/z 380 ([M+H]+). An. HPLC gave purity of 98.6% @ 280 nm. Calc'd: C, 78.40; N, 4.58; H, 3.66. Found: C, 78.45; N, 4.30; H, 3.56. The title compound was prepared by reacting 7-bromo-H-dibenzo[c,g]chromene-3,9-diol (343 mg, 1 mmol) and 3-trifluoromethoxyphenyl boronic acid (618 mg, 3 mmol) as described above in Example 23 to afford a white solid (140 mg, 33%): mp 110–112° C.; 1H NMR (DMSO-d6): δ 4.98 (2H, s), 6.61 (1H, d, J=2.3 Hz), 6.64 (1H, d, J=1.9 Hz), 6.85 (1H, dd, J=8.5, Hz J=2.4 Hz), 6.93 (1H, dd, J=8.8 Hz, J=2.3 Hz), 7.32 (1H, s), 7.38–7.44 (2H, m,), 7.64–7.68 (1H, m), 7.80 (1H, d, J=8.8 Hz), 7.83 (1H,d, J=8.6 Hz), 8.23 (1H, s), 9.61 (1H, s), 9.72 (1H, s); MS m/z 425 ([M+H]+). An. HPLC gave purity of 98.7% @ 280 nm. Calc'd: C, 66.51; H, 3.72. Found: C, 66.57; H, 3.39. The title compound was prepared by reacting 7-bromo-H-dibenzo[c,g]chromene-3,9-diol (343 mg, 1 mmol) and 4-trifluoromethoxyphenyl boronic acid (618 mg, 3 mmol) as described above in Example 23 to afford a white solid (219 mg, 52%): mp 245–248° C.; 1H NMR (DMSO-d6): δ 4.97 (2H, s), 6.60 (1H, d, J=2.3 Hz), 6.64 (1H, d, J=2.5 Hz), 6.85 (1H, dd, J=8.5, Hz J=2.5 Hz), 6.93 (1H, dd, J=8.8 Hz, J=2.3 Hz), 7.32 (1H, s), 7.38–7.44 (2H, m, ), 7.64–7.68 (1H, m), 7.80 (1H, d, J=8.8 Hz), 7.83 (1H,d, J=8.6 Hz), 8.22 (1H, s), 9.60 (1H, s), 9.71 (1H, s); MS m/z 425 ([M+H]+). An. HPLC gave purity of 99.9% @ 280 nm. Calc'd: C, 67.93; H, 3.56. Found: C, 67.76; H, 3.50. The title compound was prepared by reacting 7-bromo-H-dibenzo[c,g]chromene-3,9-diol (343 mg, 1 mmol) and 4-tert-butylphenyl boronic acid (534 mg, 3 mmol) as described above in Example 23 to afford a white solid (144 mg, 36%): mp 162–165° C.; 1H NMR (DMSO-d6): δ 1.38 (9H, s), 4.94 (2H, s), 6.63 (1H, d, J=2.4 Hz), 6.68 (1H, d, J=2.2 Hz), 6.84 (1H, dd, J=8.5, Hz J=2.4 Hz), 6.90 (1H, dd, J=8.8 Hz, J=2.3 Hz), 7.27 (2H, d, J=8.2 Hz), 7.53 (2H, d, J=8.3 Hz ), 7.79 (1H, d, J=7.6 Hz), 7.82 (1H, d, J=8.6 Hz), 8.18 (1H, s), 9.54 (1H, s), 9.69 (1H, s); MS m/z 397 ([M+H]+). An. HPLC gave purity of 99.2% @ 280 nm. Calc'd: C, 79.98; H, 6.21. Found: C, 79.24; H, 6.29. The title compound was prepared by reacting 7-bromo-H-dibenzo[c,g]chromene-3,9-diol (343 mg, 1 mmol) and 1-naphthyl boronic acid (516 mg, 3 mmol) as described above in Example 23 to afford a white solid (110 mg, 28%): mp 160–162° C.; 1H NMR (DMSO-d6): δ 4.85 (2H, s), 6.24 (1H, d, J=2.4 Hz), 6.57 (1H, d, J=2.3 Hz), 6.84–6.92 (3H, m), 7.26–7.51 (4H, m), 7.63–7.68 (1H, m), 7.83 (1H, d, J=8.1 Hz), 7.88 (1H, d, J=8.5 Hz), 8.02 (1H, d, J=8.2 Hz), 8.30 (1H, s), 9.39 (1H, s), 9.70 (1H, s); MS m/z 389 ([M+H]+). An. HPLC gave purity of 95.4% @ 280 nm. Calc'd: C, 81.55; H, 4.76. Found: C, 81.39; H, 4.87. The title compound was prepared by reacting 7-bromo-H-dibenzo[c,g]chromene-3,9-diol (343 mg, 1 mmol) and 4-ethylphenyl boronic acid (450 mg, 3 mmol) as described above in Example 23 to afford a white solid (292 mg, 79%): mp 203–205° C.; 1H NMR (DMSO-d6): δ 1.29 (3H, t, J=7.6 Hz), 2.71 (2H, q, J=2.2 Hz), 4.94 (2H, s), 6.65 (2H, dd, J=13.7 Hz, J=2.4 Hz), 6.85 (1H, dd, J=8.5 Hz, J=2.6 Hz), 6.90 (1H, dd, J=8.8 Hz, J=2.4 Hz), 7.25 (2H, d, J=7.9 Hz ), 7.34 (2H, d, J=8.2 Hz), 7.76 (1H, d, J=8.8 Hz), 7.82 (1H, d, J=8.6 Hz ), 8.17 (1H, s), 9.51 (1H, s), 9.69 (1H, s); MS m/z 369 ([M+H]+). An. HPLC gave purity of 99.8% @ 280 nm. Calc'd: C, 79.56; H, 5.61. Found: C, 79.86; H, 5.37. 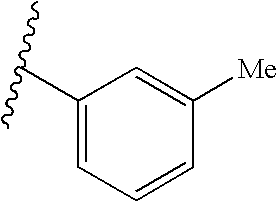 The title compound was prepared by reacting 7-bromo-H-dibenzo[c,g]chromene-3,9-diol (343 mg, 1 mmol) and 3,5-dimethylphenyl boronic acid (450 mg, 3 mmol) as described above in Example 23 to afford a white solid (270 mg, 73%): mp 220–223° C.; 1H NMR (DMSO-d6): δ 2.34 (6H, s), 4.93 (2H, ), 6.62 (2H, dd, J=9.7 Hz, J=2.4 Hz), 6.84 (1H, dd, J=8.5 Hz, J=2.4 Hz ), 6.88–6.91 (3H, m), 7.04 (1H, s), 7.76 (1H, d, J=8.9 Hz), 7.82 (1H, d, J=8.6 Hz), 8.16 (1H, s), 9.49 (1H, s), 9.69 (1H, s); MS m/z 369 ([M+H]+). An. HPLC gave purity of 97.2% @ 280 nm. Calc'd: C, 80.52; H, 5.54. Found: C, 80.64; H, 5.32. Representative examples of the invention were evaluated for their ability to compete with 17β-estradiol for both ERα and ERβ. This test procedure provides the methodology for one to determine whether a particular compound binds to the estrogen receptor (and is therefore “estrogenic”) and whether there is selectivity for ERα or ERβ. The values are shown in the Table infra and are reported as IC50s. 17β-estradiol is included as a standard reference for comparison. The procedure used is briefly described below. A crude lysate of E. coli expressing the estrogen receptor ligand binding domains (D,E, & F) of human ERα or ERβ was prepared. Both receptors and compounds were diluted in 1× Dulbecco's PBS (DPBS) supplemented with 1 mM EDTA. Using a high binding masked microtiter plate, 100 uL of receptor (1 uG/well) was combined with 2 nM [3H]-17β-estradiol and various concentrations of compound. After between 5 and 15 hours at room temperature, the plates were washed with DPBS/1 mM EDTA and bound radioactivity determined by liquid scintillation counting. The IC50 is defined as the concentration of compound that decreases total 17β-estradiol binding by 50%. The results obtained are described in the table below. The results obtained in the standard pharmacologic test procedure demonstrate that the compounds of this invention are estrogenic compounds, some with strong preferential affinity for the ERβ receptor. The compounds of this invention range from having high preferential affinity for ERβ over ERα to almost equal affinity for both receptors. Thus, compounds of this invention will span a range of activity based, at least partially, on their receptor affinity selectivity profiles. Additionally, because each novel receptor ligand complex is unique and thus its interaction with various coregulatory proteins is unique, compounds of this invention will display different modulatory behavior depending on the cellular context they are in. For example, in some cell-types, it is possible for a compound to behave as an estrogen agonist while in other tissues, an antagonist. Compounds with such activity have sometimes been referred to as SERMs (Selective Estrogen Receptor Modulators). Unlike many estrogens, however, many of the SERMs do not cause increases in uterine wet weight. These compounds are antiestrogenic in the uterus and can completely antagonize the trophic effects of estrogen agonists in uterine tissue. These compounds, however, act as estrogen agonists in the bone, cardiovascular, and central nervous systems. Due to this tissue selective nature of these compounds, they are useful in treating or preventing in a mammal disease states or syndromes which are caused or associated with an estrogen deficiency (in certain tissues such as bone or cardiovascular) or an excess of estrogen (in the uterus or mammary glands). Even beyond such cell-specific modulation, compounds of this invention also have the potential to behave as agonists on one receptor type while behaving as antagonists on the other. For example, it has been demonstrated that compounds can be an antagonist on ERβ while being an agonist on ERα (Meyers, Marvin J.; Sun, Jun; Carlson, Kathryn E.; Katzenellenbogen, Benita S.; Katzenellenbogen, John A. J. Med. Chem. (1999), 42(13), 2456–2468). Such ERSAA (Estrogen Receptor Selective Agonist Antagonist) activity provides for pharmacologically distinct estrogenic activity within this series of compounds. Standard pharmacological test procedures are readily available to determine the activity profile of a given test compound. The following examples briefly summarize several representative test procedures. Standard pharmacological test procedures for SERMs are also provided in U.S. Pat. Nos. 4,418,068 and 5,998,402. Female Sprague Dawley CD rats, ovx or sham ovx, are obtained 1 day after surgery from Taconic Farm (weight range 240–275 g). They are housed 3 or 4 rats/cage in a room on a 12/12 (light/dark) schedule and provided with food (Purina 5K96C rat chow) and water ad libitum. Treatment for all studies begin 1 day after the animals arrival and dosed 7 days per week as indicated for 6 weeks. A group of age matched sham operated rats not receiving any treatment serve as an intact, estrogen replete control group for each study. After the pQCT scan is completed, the image is displayed on the monitor. A region of interest including the tibia but excluding the fibula is outlined. The soft tissue is automatically removed using an iterative algorithm. The density of the remaining bone (total density) is reported in mg/cm3. The outer 55% of the bone is peeled away in a concentric spiral. The density of the remaining bone (Trabecular density) is reported in mg/cm3. One week after BMD evaluation the rats are euthanized by carbon dioxide suffocation and blood collected for cholesterol determination. The uteri are removed and the weights taken. Total cholesterol is determined using a Boehringer-Mannheim Hitachi 911 clinical analyzer using the Cholesterol/HP kit. Statitstics were compared using one-way analysis of variance with Dunnet's test. Stock solutions of test compounds (usually 0.1 M) are prepared in DMSO and then diluted 10 to 100-fold with DMSO to make working solutions of 1 or 10 mM. The DMSO stocks are stored at either 4° C. (0.1 M) or −20° C. (<0.1M). MCF-7 cells are passaged twice a week with growth medium [D-MEM/F-12 medium containing 10% (v/v) heat-inactivated fetal bovine serum, 1% (v/v) Penicillin-Streptomycin, and 2 mM glutaMax-1]. The cells are maintained in vented flasks at 37° C. inside a 5% CO2/95% humidified air incubator. One day prior to treatment, the cells are plated with growth medium at 25,000/well into 96 well plates and incubated at 37° C. overnight. The cells are infected for 2 hr at 37° C. with 50 μl/well of a 1:10 dilution of adenovirus 5-ERE-tk-luciferase in experimental medium [phenol red-free D-MEM/F-12 medium containing 10% (v/v) heat-inactived charcoal-stripped fetal bovine serum, 1% (v/v) Penicillin-Streptomycin, 2 mM glutaMax-1, 1 mM sodium pyruvate]. The wells are then washed once with 150 μλ of experimental medium. Finally, the cells are treated for 24 hr at 37° C. in replicates of 8 wells/treatment with 150 μλ/well of vehicle (≦0.1% v/v DMSO) or compound that is diluted ≧1000-fold into experimental medium. Initial screening of test compounds is done at a single dose of 1 μM that is tested alone (agonist mode) or in combination with 0.1 nM 17β-estradiol (EC80; antagonist mode). Each 96 well plate also includes a vehicle control group (0.1% v/v DMSO) and an agonist control group (either 0.1 or 1 nM 17β-estradiol). Dose-response experiments are performed in either the agonist and/or antagonist modes on active compounds in log increases from 10−14 to 10−5 M. From these dose-response curves, EC50 and IC50 values, respectively, are generated. The final well in each treatment group contains 5 μl of 3×10−5 M ICI-182,780 (10−6 M final concentration) as an ER antagonist control. After treatment, the cells are lysed on a shaker for 15 min with 25 μl/well of 1× cell culture lysis reagent (Promega Corporation). The cell lysates (20 μl) are transferred to a 96 well luminometer plate, and luciferase activity is measured in a MicroLumat LB 96 P luminometer (EG & G Berthold) using 100 μl/well of luciferase substrate (Promega Corporation). Prior to the injection of substrate, a 1 second background measurement is made for each well. Following the injection of substrate, luciferase activity is measured for 10 seconds after a 1 second delay. The data are transferred from the luminometer to a Macintosh personal computer and analyzed using the JMP software (SAS Institute); this program subtracts the background reading from the luciferase measurement for each well and then determines the mean and standard deviation of each treatment. The luciferase data are transformed by logarithms, and the Huber M-estimator is used to down-weight the outlying transformed observations. The JMP software is used to analyze the transformed and weighted data for one-way ANOVA (Dunnett's test). The compound treatments are compared to the vehicle control results in the agonist mode, or the positive agonist control results (0.1 nM 17β-estradiol) in the antagonist mode. For the initial single dose experiment, if the compound treatment results are significantly different from the appropriate control (p<0.05), then the results are reported as the percent relative to the 17β-estradiol control [i.e., ((compound−vehicle control)/(170-estradiol control−vehicle control))×100]. The JMP software is also used to determine the EC50 and/or IC50 values from the non-linear dose-response curves. Porcine aortas are obtained from an abattoir, washed, transported in chilled PBS, and aortic endothelial cells are harvested. To harvest the cells, the intercostal vessels of the aorta are tied off and one end of the aorta clamped. Fresh, sterile filtered, 0.2% collagenase (Sigma Type I) is placed in the vessel and the other end of the vessel then clamped to form a closed system. The aorta is incubated at 37° C. for 15–20 minutes, after which the collagenase solution is collected and centrifuged for 5 minutes at 2000× g. Each pellet is suspended in 7 mL of endothelial cell culture medium consisting of phenol red free DMEM/Ham's F12 media supplemented with charcoal stripped FBS (5%), NuSerum (5%), L-glutamine (4 mM), penicillin-streptomycin (1000 U/ml, 100 μg/ml) and gentimicin (75 μg/ml), seeded in 100 mm petri dish and incubated at 37° C. in 5% CO2. After 20 minutes, the cells are rinsed with PBS and fresh medium added, this was repeated again at 24 hours. The cells are confluent after approximately 1 week. The endothelial cells are routinely fed twice a week and, when confluent, trypsinized and seeded at a 1:7 ratio. Cell mediated oxidation of 12.5 μg/mL LDL is allowed to proceed in the presence of the compound to be evaluated (5 μM) for 4 hours at 37° C. Results are expressed as the percent inhibition of the oxidative process as measured by the TBARS (thiobarbituric acid reactive substances) method for analysis of free aldehydes (Yagi K., Biochem Med 15:212–216 (1976)). D12 rat hypothalamic cells are subcloned from the RCF17 parental cell line and stored frozen. They are routinely grown in DMEM:F12 (1:1), glutaMAX-1 (2 mM), penicillin (100 U/ml)-streptomycin (100 mg/ml), plus 10% fetal bovine serum (FBS). The cells are plated in phenol red-free medium (DMEM:F12, glutaMAX, penicillin-streptomycin) containing 2–10% charcoal stripped FBS at a subconfluent density (1–4×10 <6> cells/150 mm dish). The cells are refed 24 h later with medium containing 2% stripped serum. To test for agonist activity, cells are treated with 10 nM 17β-estradiol or various doses of test compound (1 mM or a range from 1 pM to 1 mM). To test for antagonist activity the cells are treated with 0.1 nM 17β-estradiol in the absence or presence of varying doses (100 pM to 1 mM) of test compound. Control dishes are also treated with DMSO as a negative control. Forty-eight hours after hormone addition, the cells are lysed and binding test procedure performed. For each binding test procedure 100–150 mg protein is incubated with 10 nM 3H-R5020+100-fold excess R5020 in a 150 ml volume. Triplicate reactions (three with R5020, three without R5020) are prepared in a 96 well plate. The protein extract is added first followed by 3H-R5020 or 3H-R5020 +100× unlabeled R5020. The reaction is performed for 1–2 hr at room temperature . The reaction is stopped by the addition of 100 ml cold 5% charcoal (Norit SX-4), 0.5% dextran 69K (Pharmacia) in TE pH 7.4 . After 5 min at room temperature, the bound and unbound ligand are separated by centrifugation (5 min, 1000 RCF, 4° C.). The supernatant solution (˜150 ml) is removed and transferred to a scintillation vial. Following the addition of scintillation fluid (Beckman Ready Protein+), the samples are counted for 1 min in a scintillation counter. Ovariectomized animals are randomly divided into groups that are injected with vehicle (50% DMSO, 40% PBS, 10% ethanol vehicle), 17β-estradiol (200 ng/kg) or the compound to be tested. Additional animals are injected with the test compound lhr prior to injection of 17β-estradiol to evaluate the antagonistic properties of this compound. Six hrs after s.c. injection, animals are euthanized with a lethal dose of CO2 and their brains collected and frozen. Tissue collected from animals is cut on a cryostat at −16° C. and collected on Silane-coated microscope slides. The section-mounted slides are then dried on a slide warmer maintained at 42° C. and stored in desiccated slide boxes at −80° C. Prior to processing, the desiccated slide boxes are slowly warmed to room temperature (−20° C. for 12–16 hrs; 4° C. for 2 hrs; room temperature for 1 hr) to eliminate condensation formation on slides and thus minimize tissue and RNA degradation. The dry slides are loaded into metal racks, postfixed in 4% paraformaldehyde (pH 9.0) for 5 min and processed as previously described. A plasmid containing a 815 bp fragment of the rat PR cDNA 9 (ligand binding domain) is linearized and used to generate a S 35-UTP labeled probe that is complimentary to a portion of the rat PR mRNA. Processed section-mounted slides are hybridized with 20 ml of hybridization mix containing the riboprobe (4–6×10 6 DPM/slide) and 50% formamide and incubated overnight in a 55° C. humidified chamber. In the morning, the slides are placed in metal racks that are immersed in 2×SSC (0.15M NaCl, 0.015M sodium citrate; pH 7.0)/10 mM DTT. The racks are all transferred to a large container and washed in 2×SSC/10 mM DTT for 15 min at RT with gentle agitation. Slides are then washed in RNase buffer at 37° C. for 30 min, treated with RNase A (2 mg/ml) for 30 min at 37° C., and washed for 15 min in room temperature 1×SSC. Subsequently, the slides are washed (2×30 min) in 65° C. in 0.1×SSC to remove nonspecific label, rinsed in room temperature 0.1×SSC for 15 min and dehydrated with a graded series of alcohol: ammonium acetate (70%, 95%, and 100%). Air dried slides are opposed to x-ray film for 3 days and then photographically processed. The slides from all animals are hybridized, washed, exposed and photographically processed together to eliminate differences due to interassay variation in conditions. Animals are euthanized by CO2 inhalation and exsanguination. Their thoracic aortas are rapidly removed and placed in 37° C. physiological solution with the following composition (mM): NaCl (54.7), KCl (5.0), NaHCO3 (25.0), MgCl2 2H2O (2.5), D-glucose (11.8) and CaCl2 (0.2) gassed with CO2—O2, 95%/5% for a final pH of 7.4. The advantitia is removed from the outer surface and the vessel is cut into 2–3 mm wide rings. Rings are suspended in at 10 mL tissue bath with one end attached to the bottom of the bath and the other to a force transducer. A resting tension of 1 gram is placed on the rings. Rings are equilibrated for 1 hour, signals are acquired and analyzed. Male Sprague-Dawley, CD rats (Charles River, Kingston, N.Y.) weighing 200–250 g on arrival are used. For one week, the rats are housed, six per cage, with standard laboratory chow and water available ad libitum. Housing is in a colony room maintained at 22° C. and had a 12 hour light/dark cycle with lights on at 6:00 AM. Following habituation to the facility, animals are individually housed and maintained at 85% of free-feeding weight. Once stable weights are attained, the rats are acclimated to the 8-arm radial maze. The structure of the maze is an adaptation from that of Peele and Baron (Pharmacology, Biochemistry, and Behavior, 29:143–150, 1988). The maze is elevated to a height of 75.5 cm and composed of a circular area surrounded by 8 arms radiating away from the center, equidistant from one another. Each arm is 58 cm long×13 cm high. A clear plexiglass cylinder is oared to enclose the animal in the center portion of the maze prior to the start of each session. Each arm of the maze is equipped with 3 sets of photocells interfaced to a data acquisition unit, which in turn is interfaced to a computer. The photocells are used to track the movement of the rat in the maze. Pellet feeders located above food cups at the end of each arm, dispensed two 45 mg chocolate pellets when the outer photocell of the arm is activated for the first time in a given session. The maze is located in a testing room with black and white geometric posters on each wall to serve as visual cues. During all training and testing procedures, white noise is audible (˜70 db). Primary cortical neurons were produced from rat brains that were 0–1 day old using a variation of methods described by Monyer et al. 1989, Brain Research 483:347–354. Dispersed brain tissue was grown in DMEM/10% PDHS (pregnant donor horse serum) for three days and then treated with cytosine arabinoside (ARC) for two days to remove contaminating glial cells. On day 5, the ARC media was removed and replaced with DMEM/10% PDHS. The neuronal cells were cultured for a further 4–7 days before use. Control primary neuronal cultures show progressive cell death between days 12 and 18 in culture. Twelve cultures were evaluated on days 12 and 16 for levels of the enzyme lactate dehydrogenase (LD) after adding test compound to 6 cultures maintained in DMEM and 10% PDHS on day 9 and maintaining the remaining cultures as controls. LD was assayed using a variation of the method by Wroblewski et al. 1955, Proc. Soc. Exp. Biol. Med. 90:210–213. LD is a cytosolic enzyme which is commonly used in both clinical and basic research to determine tissue viability. An increase in media LD is directly related to cell death. C6 glioma cells obtained from ATCC were plated in RPMI media with FBS at a concentration of 1×10<6> cells/ml in FALCON 25 cm2 tissue culture flasks. Four hours prior to the onset of hypoglycemia, the maintenance media was discarded, monolayers were washed twice in the appropriate media and then incubated for four hours at 37° C. in either serum free or serum free plus test compound. Kreb's Ringer Phosphate buffer was used to wash the monolayers twice before the addition of appropriate glucose treatment. RPMI medium contains 2 mg glucose/ml; flasks were divided into groups of 6 each receiving 100% glucose (2 mg/ml), 80% glucose (1.6 mg/ml), 60% glucose (1.2 mg/ml) or 0% glucose (buffer) or supplemented with test compound. All flasks were incubated for 20 hours and then evaluated for total, live, and dead cell number utilizing trypan blue. Five culture dishes containing SK—N—SH neuroblastoma cells were treated with test compound and 5 culture dishes were treated with RPMI media. Four hours later, all cell were treated with NMDA (500 mu M) for 5 minutes. Total live cells and dead cells were then determined. Male HLA-B27 rats are obtained from Taconic and provided unrestricted access to a food (PMI Lab diet 5001) and water. At the start of the study, rats are 22–26 weeks old. The following method is used to measure myeloperoxidase activity. Colon tissue is harvested and flash frozen in liquid nitrogen. A representative sample of the entire colon is used to ensure consistency between samples. The tissue is stored at −80° C. until use. Next, the tissue is weighed (approximately 500 mg) and homogenized in 1:15 w/v of 5 mM H2KPO4 (pH 6) washing buffer. The tissue is spun down at 20,000× g in a Sorvall RC 5B centrifuge for 45 minutes at 2–8° C. Supernatant is then discarded. Tissue is resuspended and homogenized in 2.5 ml (1:5 w/v) of 50 mM H2KPO4 with 10 mM EDTA and 0.5% Hex Ammonium Bromide to help solubilize the intracellular MPO. Tissue is frozen in liquid Nitrogen, thawed in a 37° C.-water bath and sonicated for 15 seconds to ensure membrane lysis. This procedure is repeated 3 times. Samples are then kept on ice for 20 minutes and centrifuged at 12,000× g for 15 minutes at 2–8° C. The supernatant is analyzed following these steps. 2. A compound according to claim 1 wherein R4 is selected from hydrogen, C1–C6 alkyl, halogen, C1–C6 alkoxy, —CN, C2–C7 alkenyl, —CHO, phenyl, furyl, thienyl, pyrimidinyl and pyridinyl. 3. A compound according to claim 1 wherein R4 is selected from hydrogen, C1–C6 alkyl, halogen, C1–C6 alkoxy, —CN, C2–C7 alkenyl, furyl, thienyl, and pyridinyl. 4. A compound according to any one of claim 1 wherein R5, R7, and R8 are each, independently, hydrogen or halogen. 5. A compound according to any one of claim 4 wherein R1, R2, R3, and R6 are each, independently, hydrogen, halogen, or hydroxyl. 6. A compound according to any one of claim 5 wherein at least one of R1, R2, R3 and R6 is hydroxyl. 7. 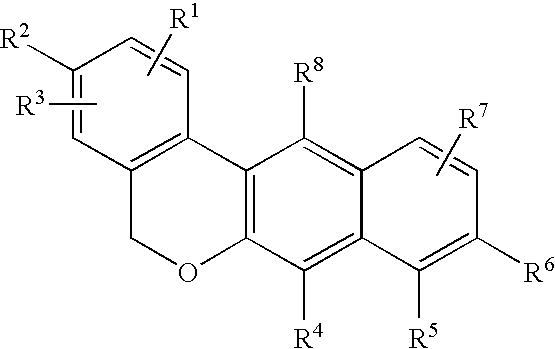 A compound according to any one of claim 6 wherein R2 and R6 are each hydroxyl. 9. A pharmaceutical composition comprising a therapeutically effective amount of a compound according to any one of claim 1 and a pharmaceutical carrier. Belgaonkar, V.H. 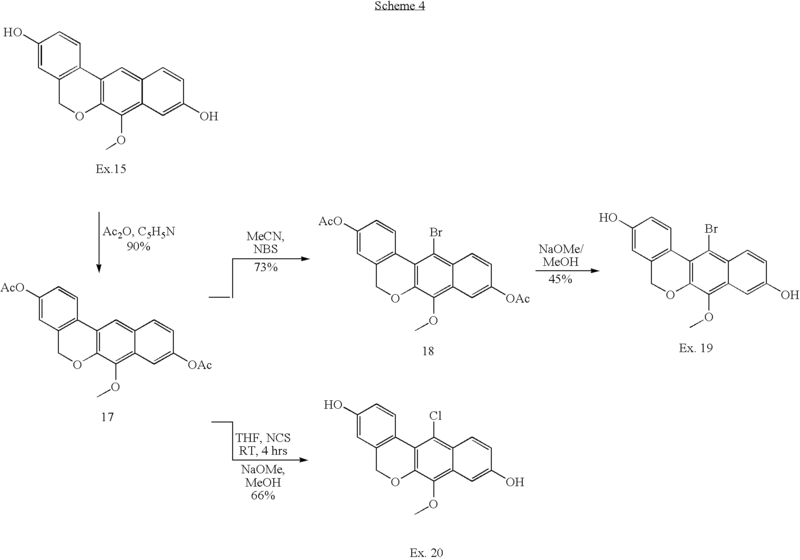 et al., "Isocoumarins: Part XIV-Synthesis of 3-Benzylisocoumarins & 3-Benzyl-1(2H)-isoquinolones," Indian Journal of Chemistry, Apr. 1975, 13, 336-338. Finking, G. et al., "Die Wirkungen von Östrogen im kardiovaskulären System," Zeitschrift fur Kardiologie 89: 442-453 (2000) (English abstract included). Knabe, J. et al., "Zur Konstitution eines Kondensationsproduktes aus Homophthalsäurehalbesterchlorid. 2. Mitt. : Synthese von 5-Hydroxy-3,4; 7,8-dibenzocumarin," Archiv Der Pharmazie, 1964, 297(9), 550-553. Levin, E. R., "Cellular Functions of the Plasma Membrane Estorgen Receptor," Trends in Endocrinology & Metabolism 10: 374-377 (1999). Moggs, J. G. et al., "Estrogen receptors: orchestrators of pleiotropic cellular responses," EMBO Reports 2: 775-781 (2001). Murray, W.V. 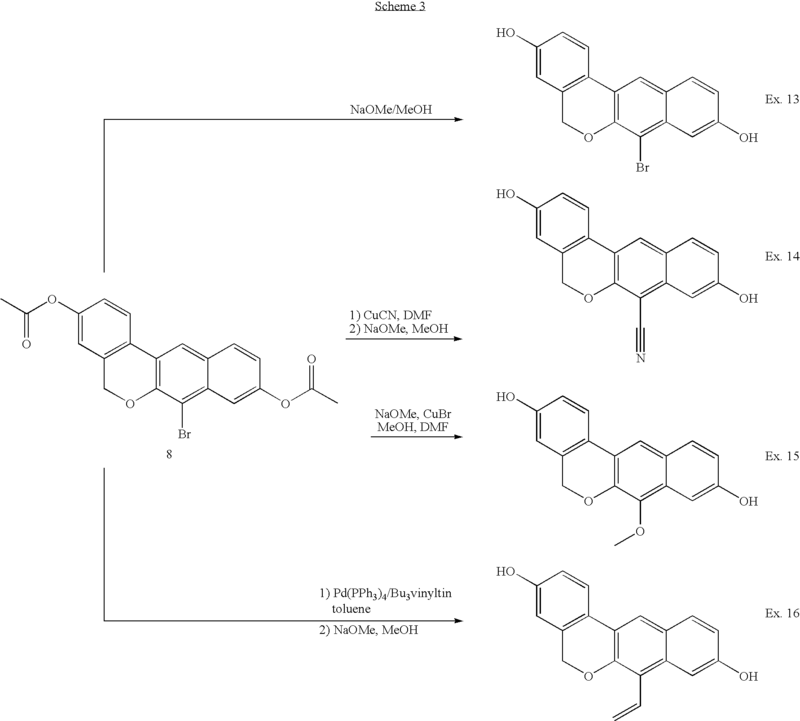 et al., "The Remarkably Facile Synthesis of 12-Methoxybenzo[d]-naphtho[2,3-b]pyran-5-one from Homophthalic Anhydride," J Chem Research (S), 1991, 10, 279. Pelzer, T. et al., "Estrogen Effects in the Myocardium: Inhibition of NF- kappaB DNA Binding by Estrogen Receptor-alpha and -beta," Biochemical & Biophysical Research Communications 286: 1153-7 (2001). Sar, M. et al., "Differential Expression of Estrogen Receptor- beta and Esrogen Receptor-beta in the Rat Ovary," Endocrinology 140: 963-971 (1999). Shcherbakova, I.V. 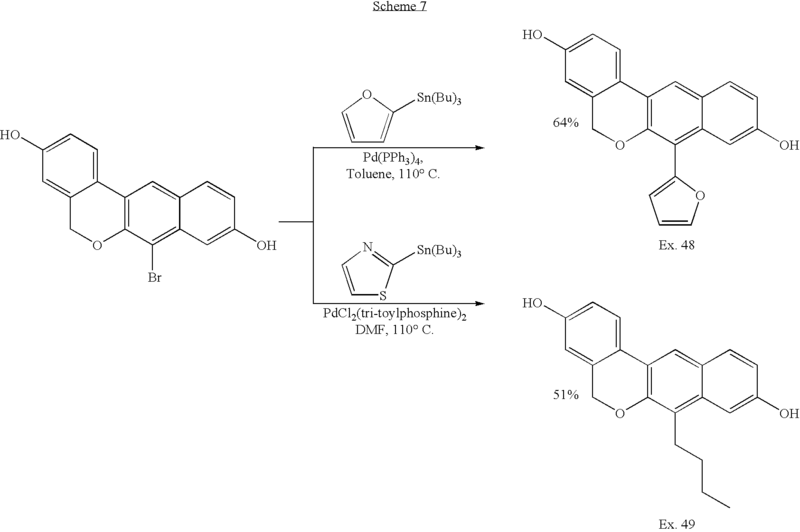 et al., "Formation of 2-naphthols . . . ," Zhurnal Organicheskoi Khimii, 1989, 25(1), 164-171. Wroblewski, F. et al., "Lactic Dehydrogenase Activity in Blood," 1955, Proc. Soc. Exp. Biol. Med. 90:210-213.